Yesterday was Thanksgiving, a holiday that I look forward to every year. Sadly for me, Thanksgiving is not celebrated in Ireland. I wasn’t going to let that stop me, though. I was determined to have ourselves a good ‘ol American Thanksgiving, even if we were the only family in our city roasting a turkey on the third Thursday of November. The day before Thanksgiving we had a baking day. 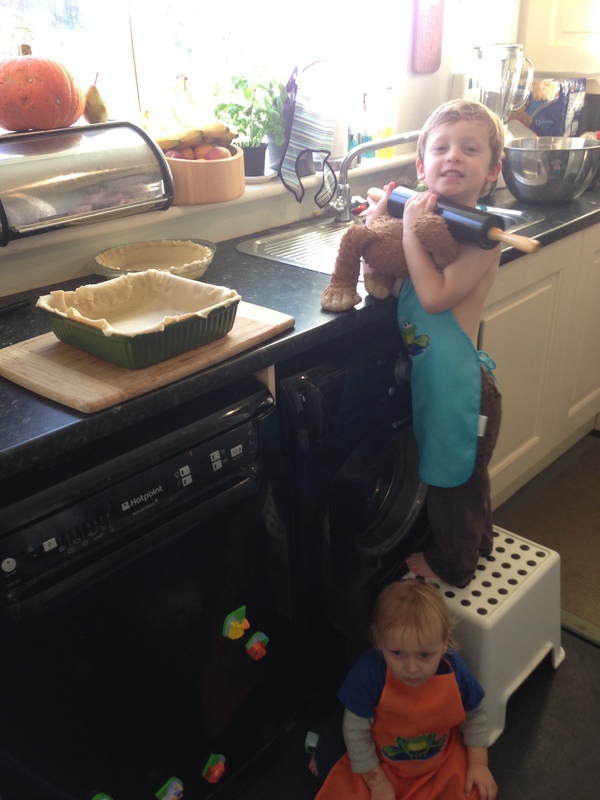 My two ‘lil pumpkins “helped” in the kitchen and we managed to bake two pumpkin pies and a casserole to prep for the big day. I am so, so, SO happy that we got to have pumpkin pie–it’s my absolute favorite treat and pumpkin-anything is very hard to come by here. Thank you to all of our American visitors who brought me canned pumpkin in the last few weeks! I got up early on Thanksgiving morning because Jacob was ready to get the party started. Since we were up at 5:30 (ugh.) 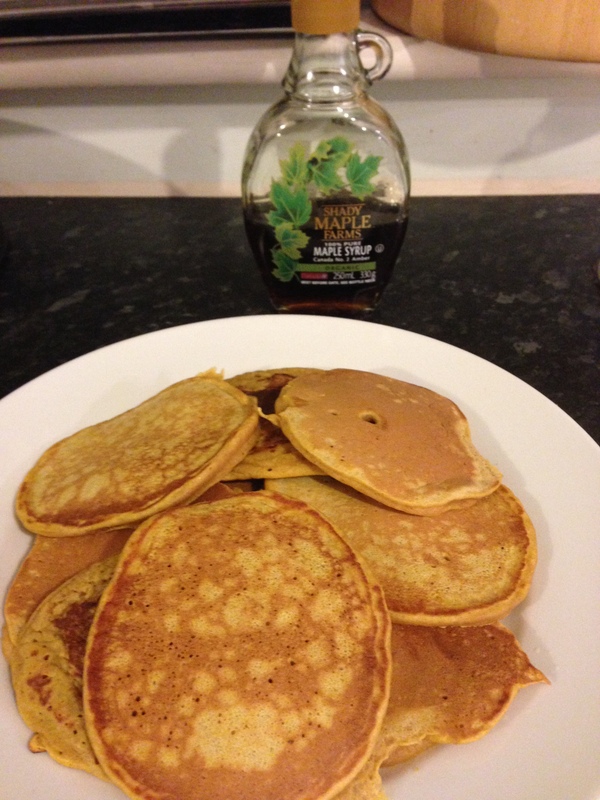 I decided to make some festive pumpkin pancakes for breakfast (again, the PUMPKIN!!!). They were awesome. 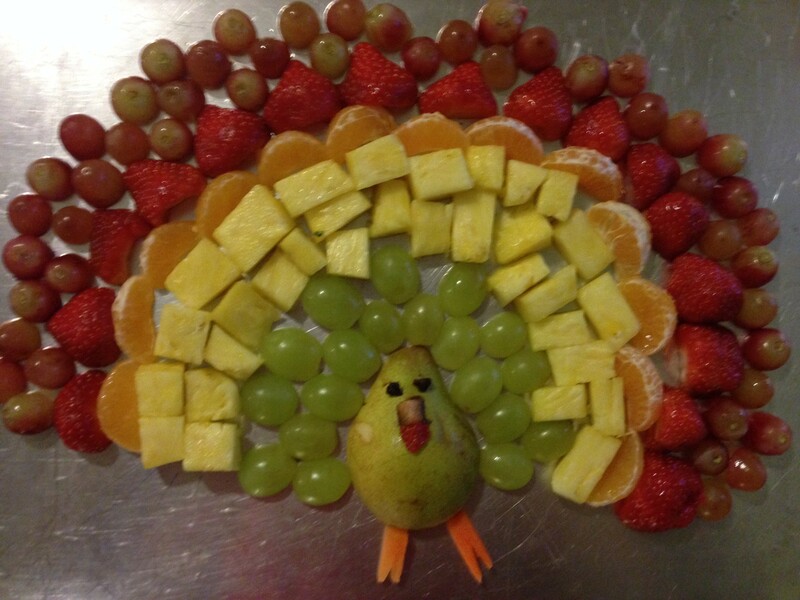 And then the former-Kindergarten teacher in me came out and I crafted not one but TWO fruit turkeys. Cute, cute, cute. We saved one of the fruiturkeys for Thanksgiving dinner and we brought the other one to David’s preschool. David’s preschool teachers are so sweet and thoughtful–they did a whole day of Thanksgiving-themed activities at school just to celebrate David’s culture (I never even thought of us having a “culture” per se but, yes, that is our culture). We brought the fuiturkey and some pumpkin muffins for the kidd-o’s snack time and we printed off a few pictures from our family Thanksgiving celebrations so David could show his classmates what this day is all about. When I picked David up from school I even heard a little girl telling her mom that “Today we learned about being thankful and turkeys”. Yep, nailed it. 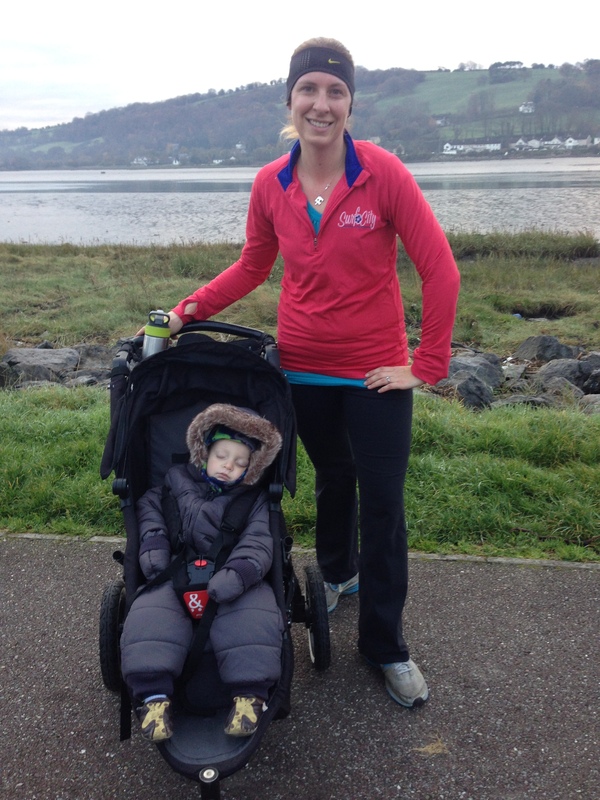 While David was at preschool I went on my own little “turkey trot” down on the Rochestown trail. It was just me and Jacob, so I guess that makes Jacob the turkey. When we got home that afternoon I managed to find the Macy’s Thanksgiving Day Parade on live streaming. I was giddy. Like, jumping up and down squealing out-of-control-happy. David thought that I’d gone completely nuts (as if he needed any more convincing). 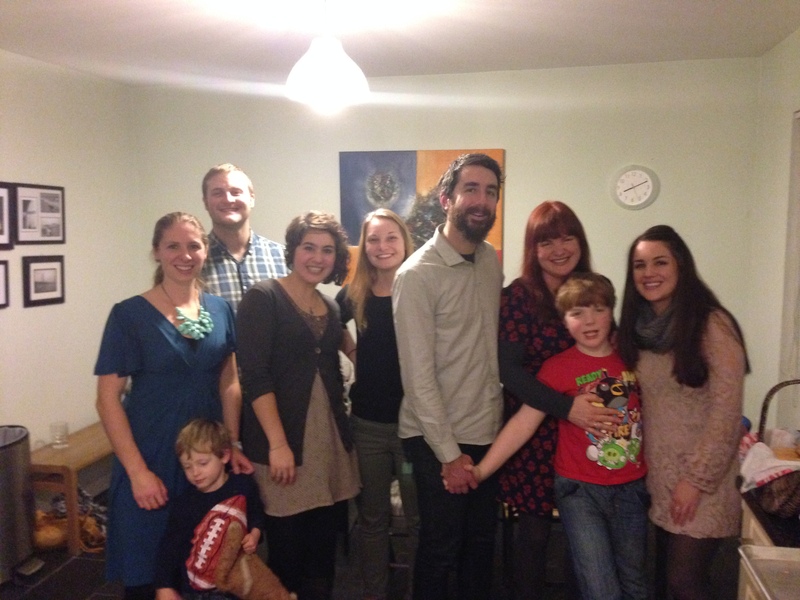 For Thanksgiving dinner we invited several of our American “expat friends” over to our house for turkey. 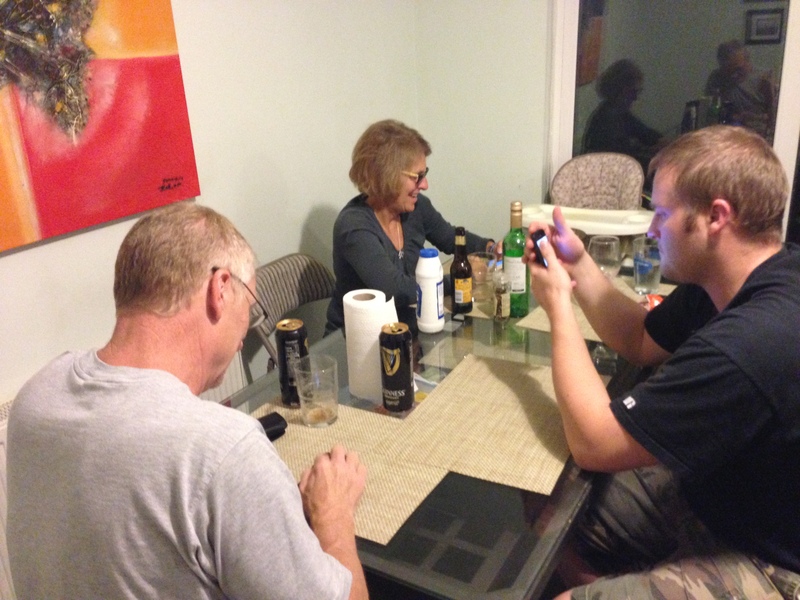 It made me so happy to have a full house and good friends to share our holiday with. 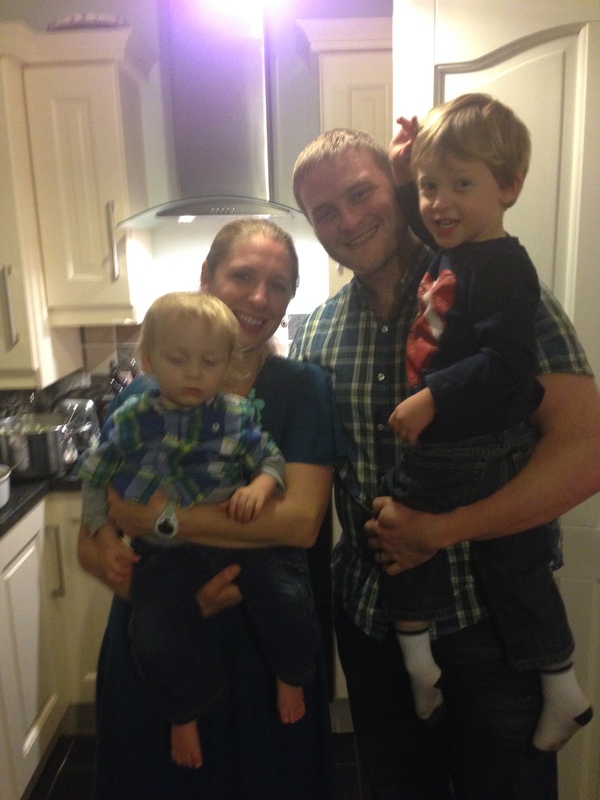 We are so amazingly blessed to have found such amazing people to share life with here in Ireland! And, then, the dinner. Oh, the dinner! It was incredible! We had turkey (which, just for the record, is not quite the same as the Butterballs that I’m used to roasting. Our bird had gnarly long legs and feather stubble. Gah! After a bit of work, though, it cooked beautifully and tasted delicious). We also had mashed potatoes and gravy, stuffing, sweet potato casserole, vegetable casserole, green bean casserole, rolls, homemade cranberry sauce, mulled wine, pumpkin cake with cream cheese frosting and–of course–pumpkin pie with whipped cream. It was oh-so-good and oh-so-Thanksgiving-y. Everyone enjoyed their dinner, and I was grateful to all of our friends who helped prepare it. Seriously, thank you, guys. It was Ammmmmmmazing! While we were waiting for our stomachs to make room for pie we watched What Does The Fox Say? 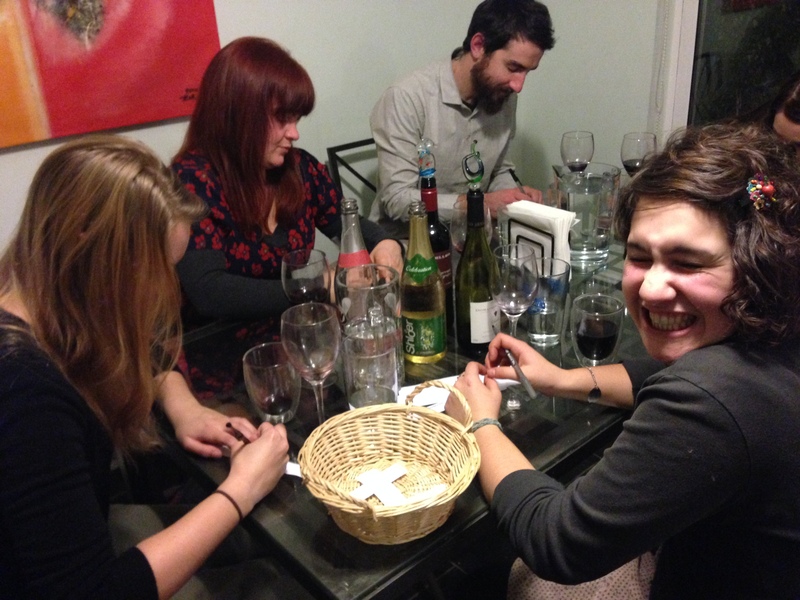 (not sure that this will become a tradition…) and we played a rousing game of “What are you thankful for?”. David was thankful for balls and beer. I’m a bit concerned. So, there you have it. 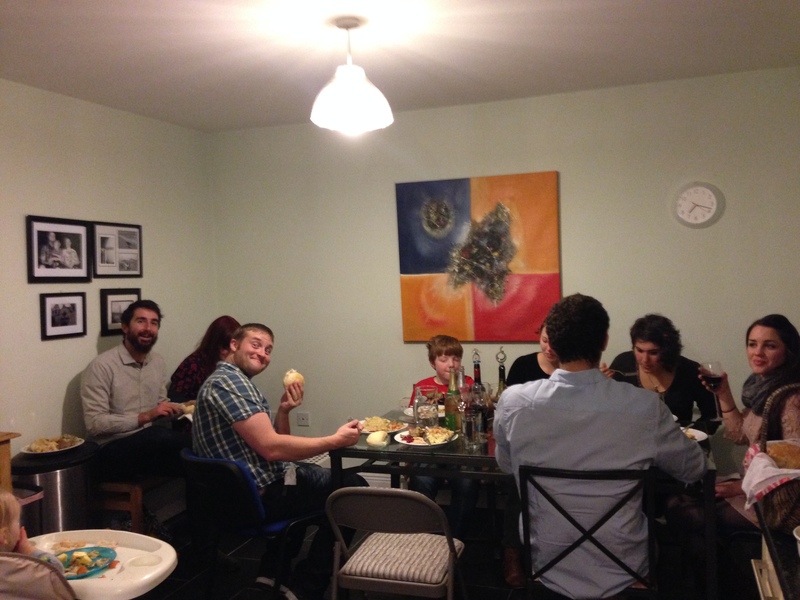 We managed to pull off an American Thanksgiving in Ireland. 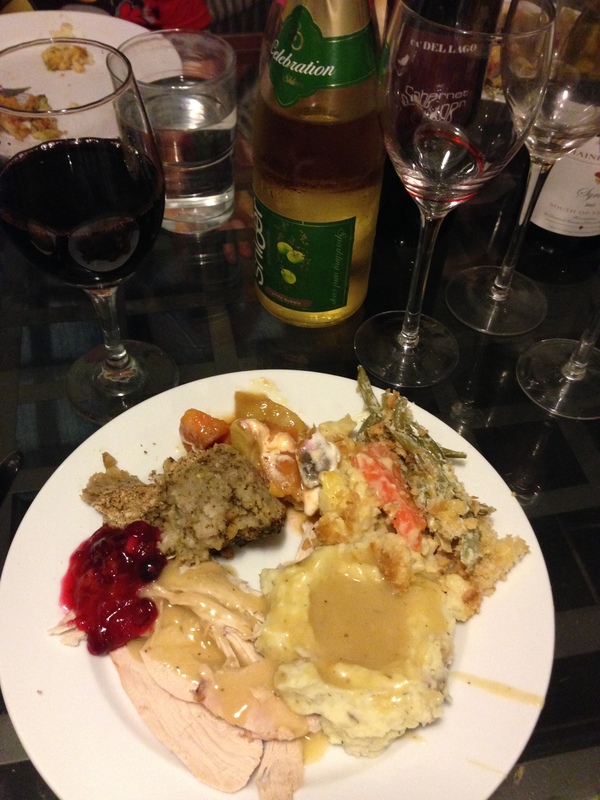 It was everything that Thanksgiving should be: good times, good food, and good people to share it all with. And, most importantly, praising God for the blessings in our lives. I have so much to be thankful for this year: the awesome opportunity to live in Ireland, our friends far and near, and an incredible family. May your life be as full as my tummy. 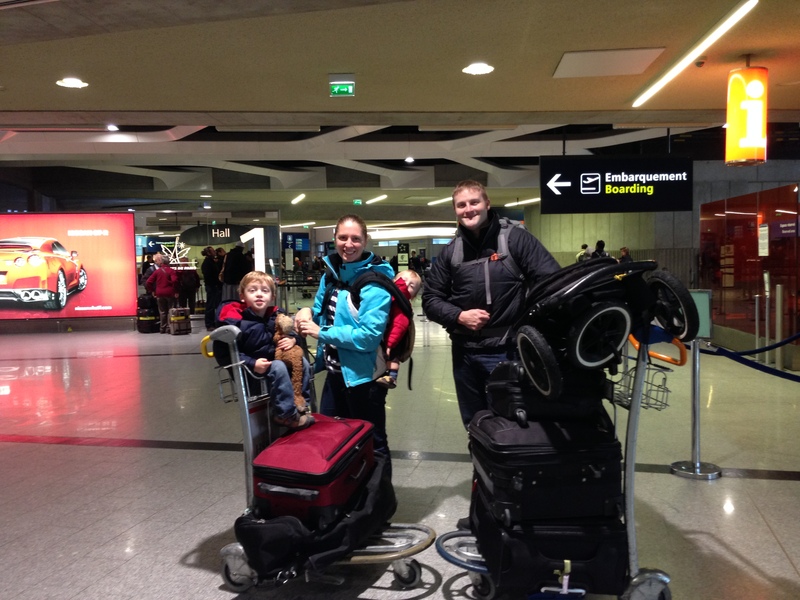 We just returned from an epic vacation: 2 weeks with 2 little kids in 2 different countries. 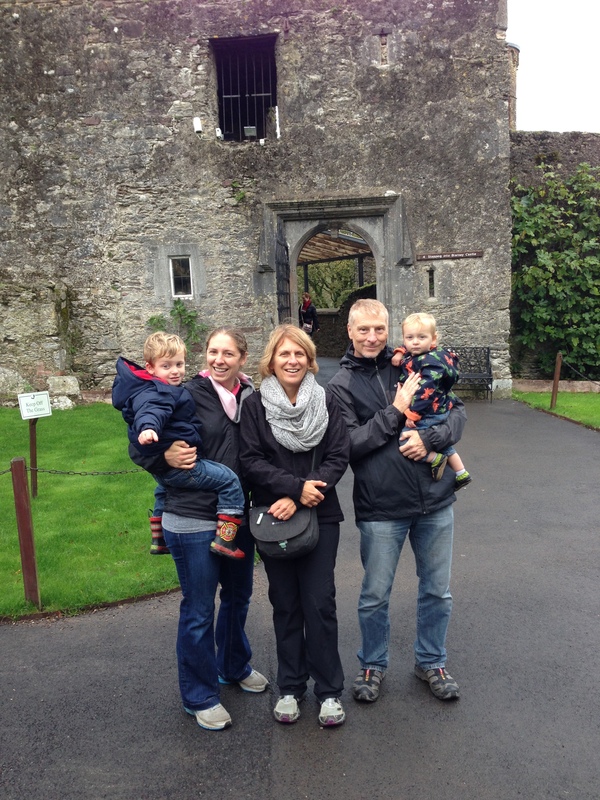 One of the main reasons we wanted to move to Ireland was for the opportunity to travel and see places we wouldn’t otherwise be able to see, and this vacation was the first of several that we hope to take in the next 2 years. 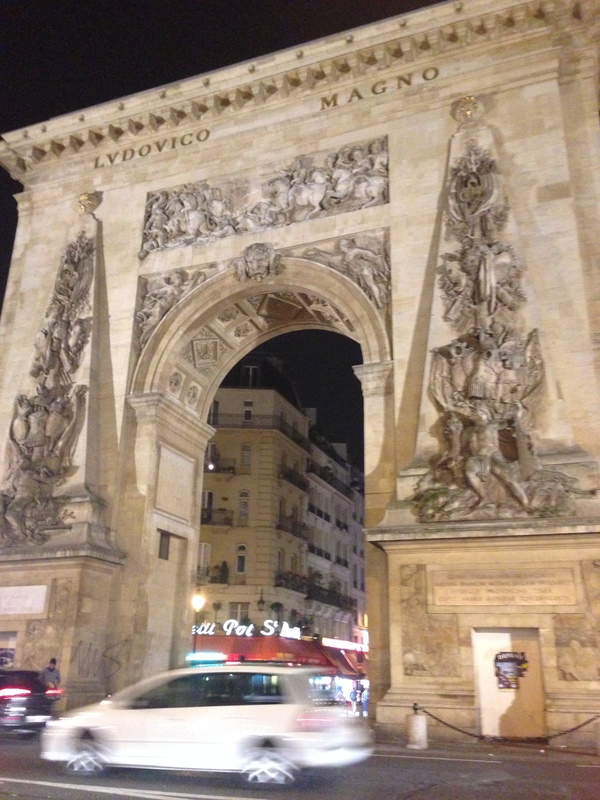 Our trip included visits to London and Paris–must-see cities on any European travel itinerary. 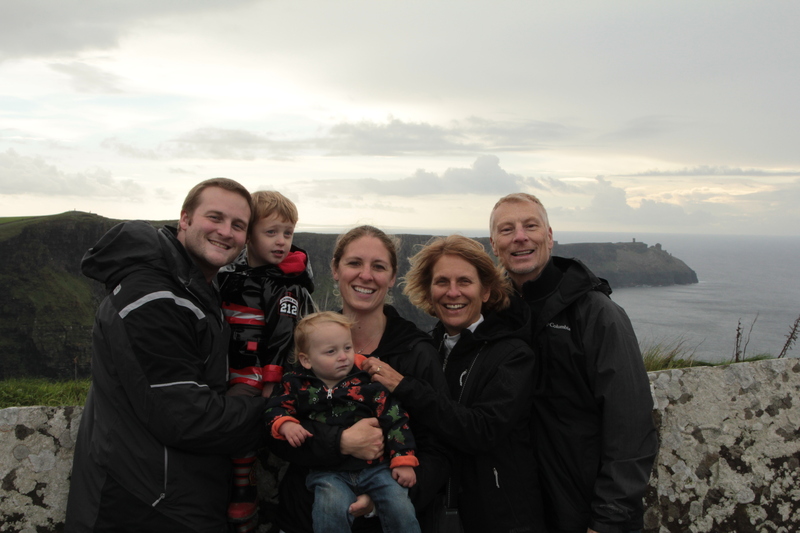 This was the longest vacation we’ve ever taken (see, we really are embracing the European way of life!) and it was…incredible. The boys traveled great, everyone stayed (mostly) healthy, we saw incredible sites, we ate delicious food, we had great accommodations, and we all had fun. Really–lots and lots of fun. While we were planning this trip I actually had a lot of anxiety about how the boys would do and how we would manage the logistics of a trip this big. And, in the end, it was one of the best vacations we’ve ever had (proof again that worrying is never worth it). Jillian is a family friend of ours (and one of our all-time favorite babysitters) from our church in Seattle. She flew all the way out here to help us with our kids on our trip. 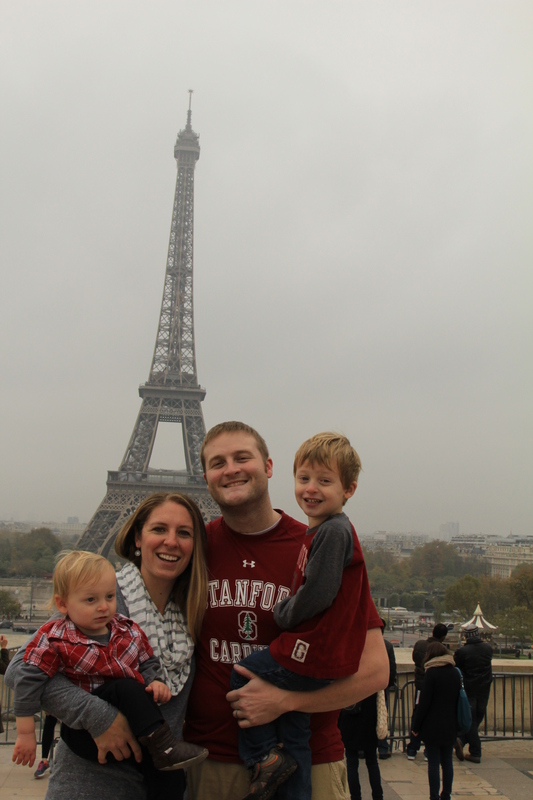 Jillian’s mom works for an airline, so she was able to get a killer deal on a plane ticket–plus, I think she was just a little bit excited about the prospect of an all-inclusive trip through Europe!–so we pulled some strings and got her out to Europe. It was great having an extra set of hands and eyes as we were traversing the cities and she also provided babysitting for us so that Jon and I could go out and do some exploring on our own. It was so, so very wonderful. Let’s just say I don’t think I’ll ever be able to travel without a helper again. Thank you, thank you for everything, Jillian! 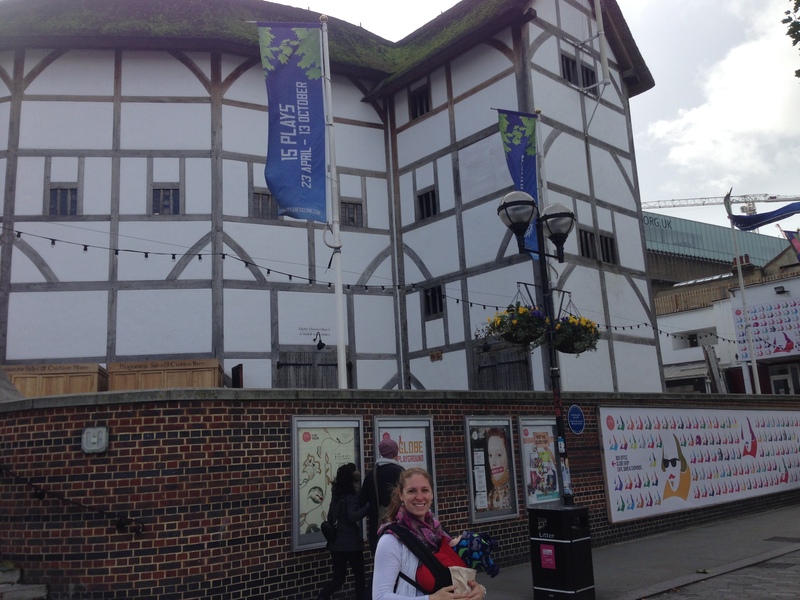 We began our trip in London. 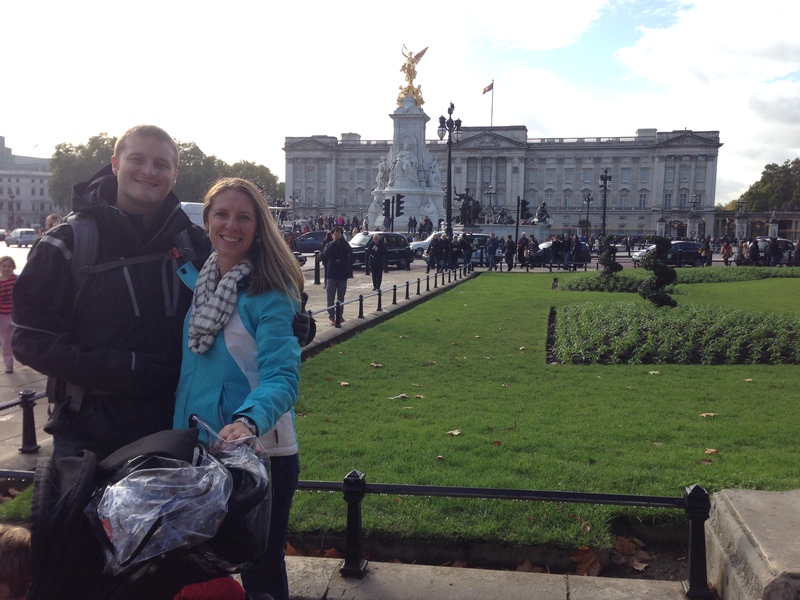 Here we are in front of Buckingham Palace. Jon and I both agreed that the palace itself was not quite what we’d expected. I had pictured this big palace set apart from the city with beautiful grounds for us to meander, but no. The palace is right smack in the middle of a busy intersection in downtown London, surrounded by busy streets and people walking by at all hours. It was beautiful, just not quite as grand and serene as I had imagined. We did get to watch the spectacle of the changing of the guard at Buckingham Palace. 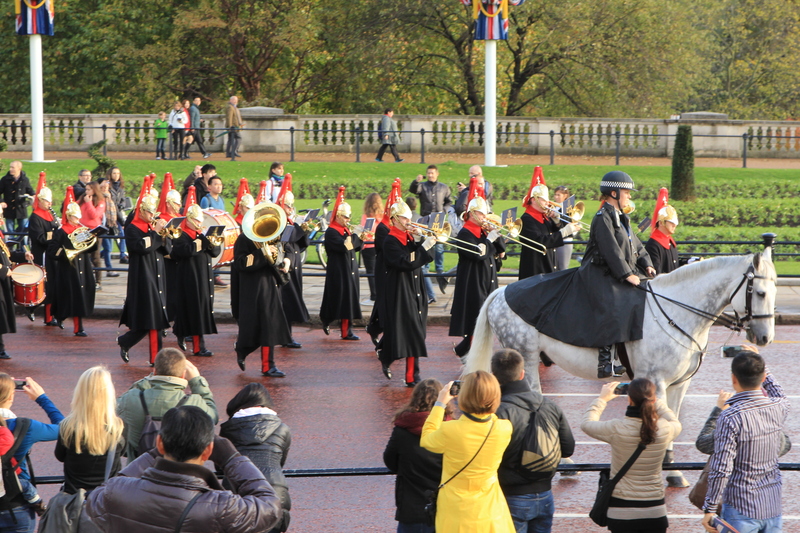 There were bands and horses and fancy soldiers marching around. The whole thing lasted about an hour, so we sat there and ate our lunch while the guards did their thing. While we were at Buckingham Palace we also visited the Royal Mews (the stables where they keep all of the royal horses and carriages). 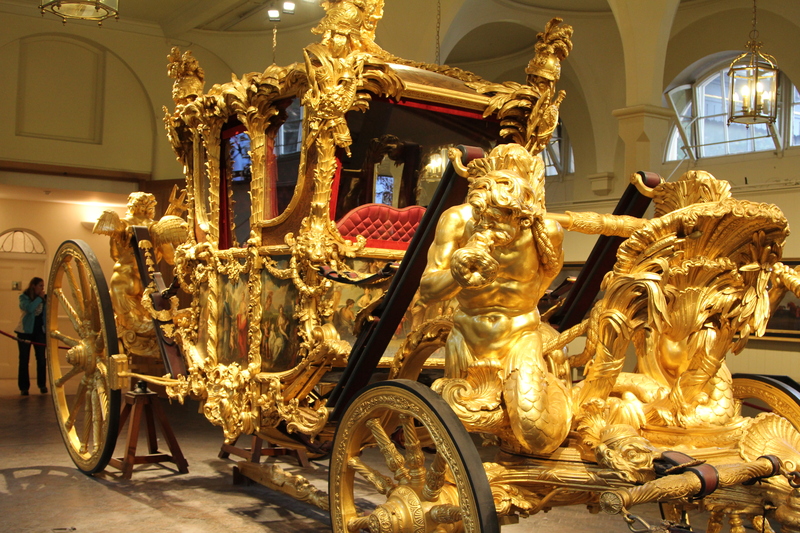 This is one of several royal carriages that was on display–definitely fit for a king! After visiting Buckingham Palace we walked down the street to Westminster Abbey, one of the largest, oldest, most fascinating churches in Europe. This is the church where Wills and Kate and Prince Charles and Princess Diana got married. It’s also where many famous people are buried. In addition to almost every monarch to ever set foot on the British throne, many “commoners” have found their final resting place here: Charles Darwin, Dietrich Bonhoeffer, Charlotte Bronte, Winston Churchill, and Handel to name a few. 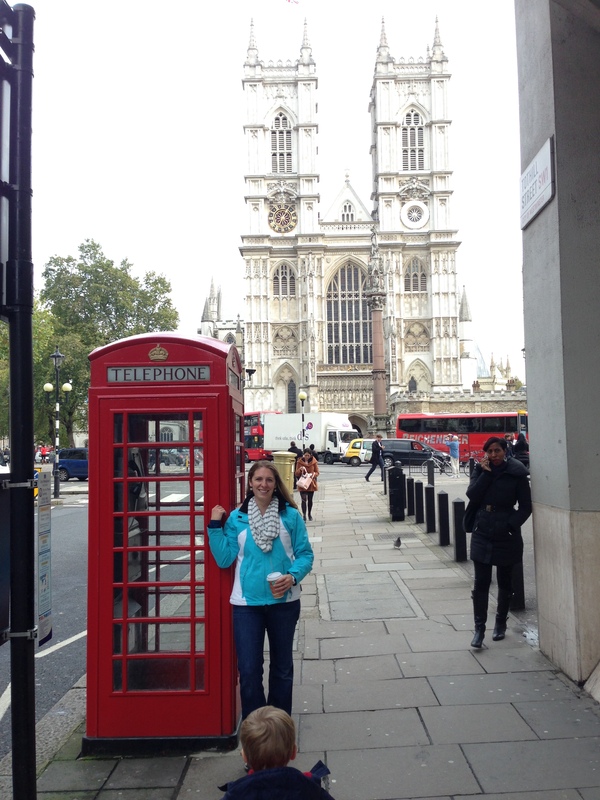 I like this photo of me with Westminster Abbey because it’s so very London: the Abbey, a red phone booth, and a double-decker bus. 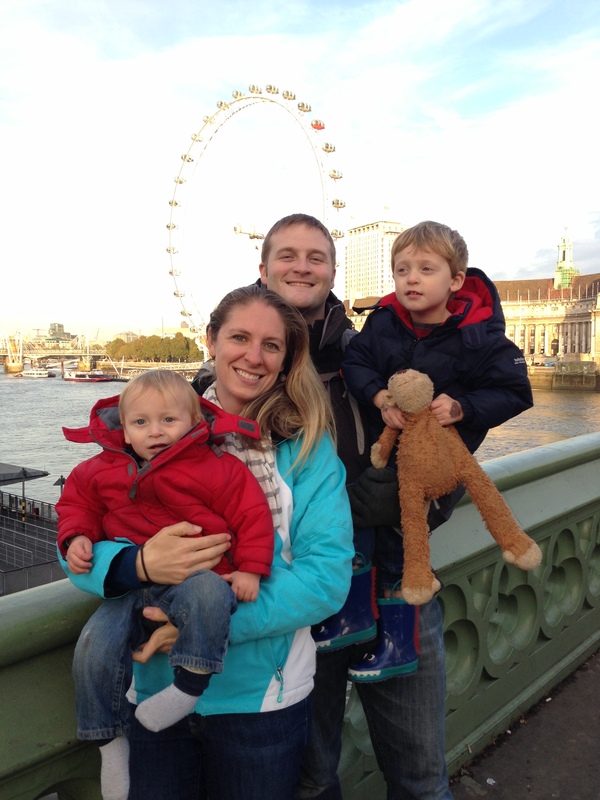 Since our first day in London was a “grown up day”, the next day was a “kid day” . 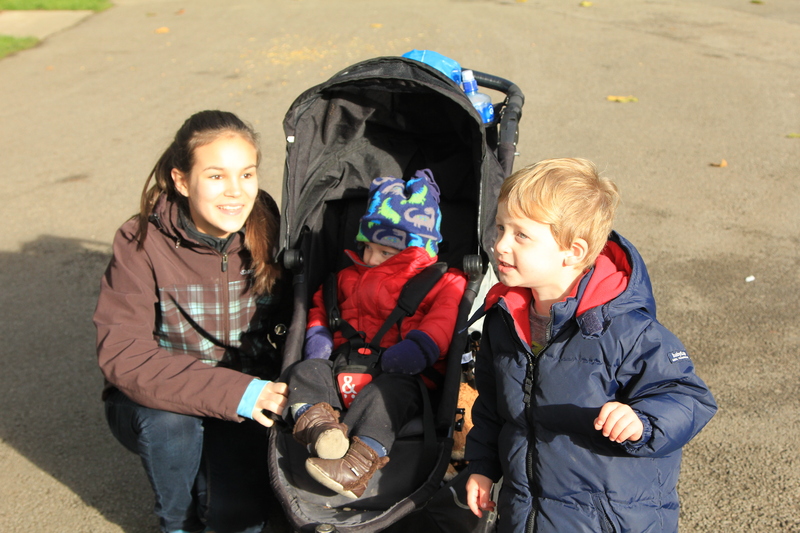 We visited the London Zoo, a beautiful zoo and one of the largest that we’ve ever been to. We spent all day exploring the zoo and watching the animals. 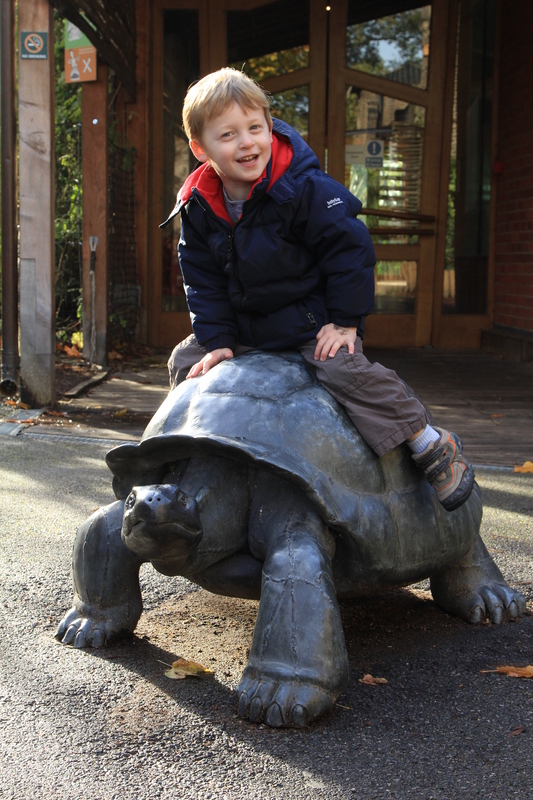 In addition to the standard zoo animals, there were some pretty unique ones: Okapi (a cousin of the zebra), camels, a pygmy hippo (David’s favorite animal by far), and huge Galapagos tortoises (disclaimer: David is not sitting on a real turtle, but they were really that big!). We got to be quite the experts at navigating the public transportation systems in both cities on this trip. 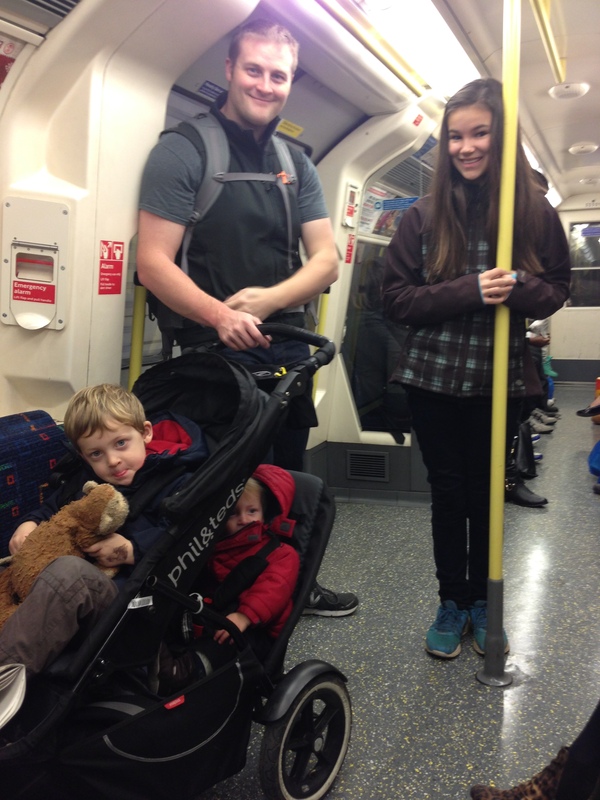 While the subways came frequently and got you anywhere in the city within minutes, we found them a bit difficult to navigate with a stroller. You see, subways are underground. And to get underground you go down stairs. Lots and lots and lots of stairs. And then, when you arrive at your destination, you have to get back above ground. And that means–you guessed it!–lots and lots of stairs. Luckily Jon is like the Incredible Hulk when it comes to lifting and we managed just fine (minus a few thrown-out backs–collateral damage, I guess). From The Globe we walked onward to see more of the city. 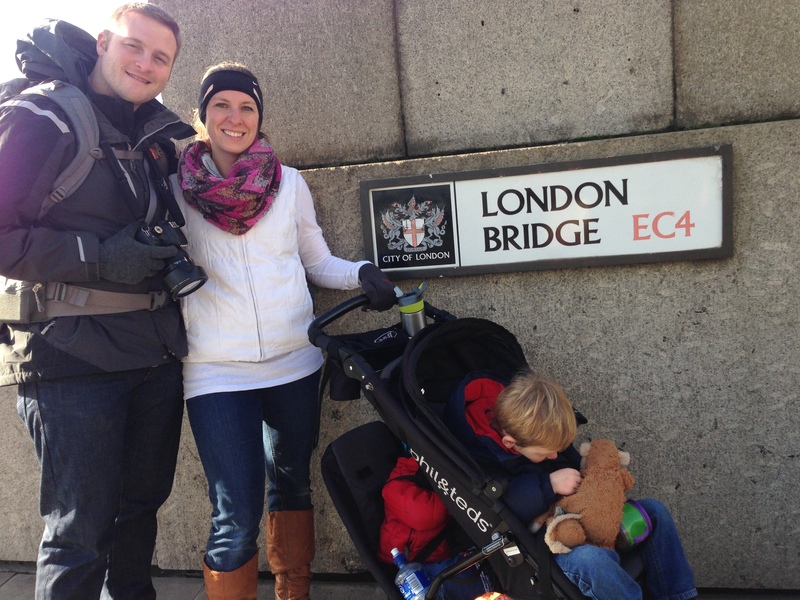 We found London Bridge which, to my great disappointment, is just a bridge. Not a fancy bridge or a beautiful bridge or a quaint old bridge. Just a bridge with 5 lanes of traffic driving over it. At least it wasn’t falling down. At the base of Tower Bridge is the Tower of London. 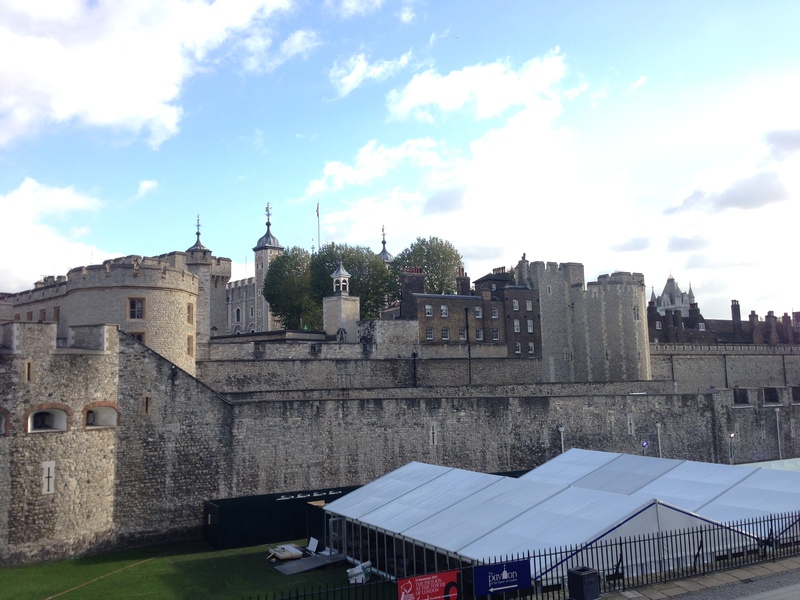 The Tower of London is not a tower at all–it is a huge, sprawling castle with lots of towers and lots of history. The Tower of London was the royal castle of the British monarchy for several centuries. 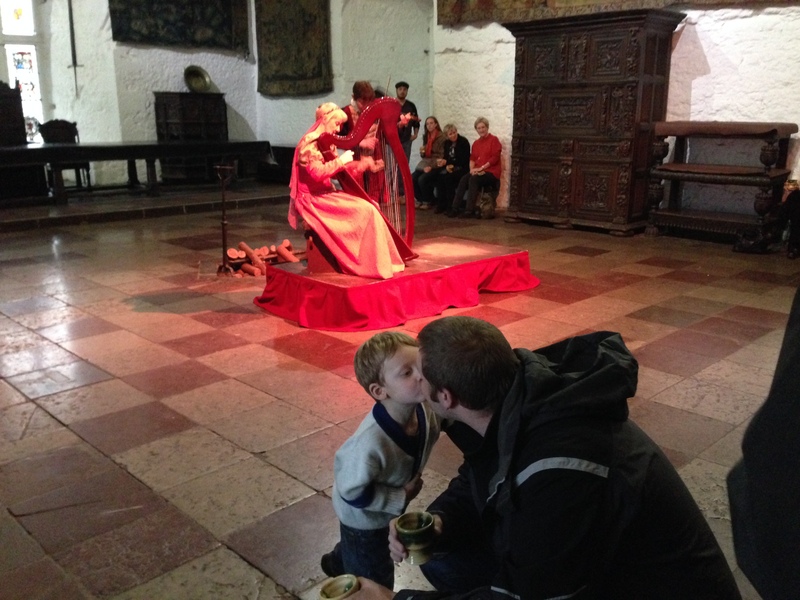 Today, visitors can go inside the castle to explore the bedrooms, throne rooms, secret passages and even the dungeon. 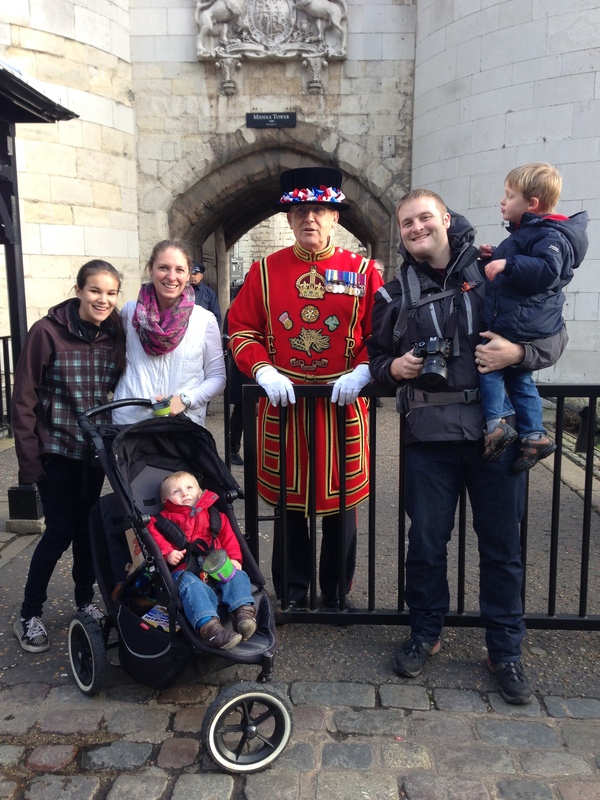 This is also where the Crown Jewels are on display–they even have special jewel guards here called “Beefeaters” (not sure where the name came from, but they were all very cute in their fancy uniforms). It was quite fascinating to see all those glittering jewels and gold, and to picture how they would look on top of my head if Wills had chosen me instead of Kate (I have to say, though, I think we all fared better the way things worked out). One of the best perks of having our helper on this trip was that Jon and I were able to go out on several dates. We had lovely (quiet) dinners, stayed up until grown-up hours exploring the city, and even took in some shows. 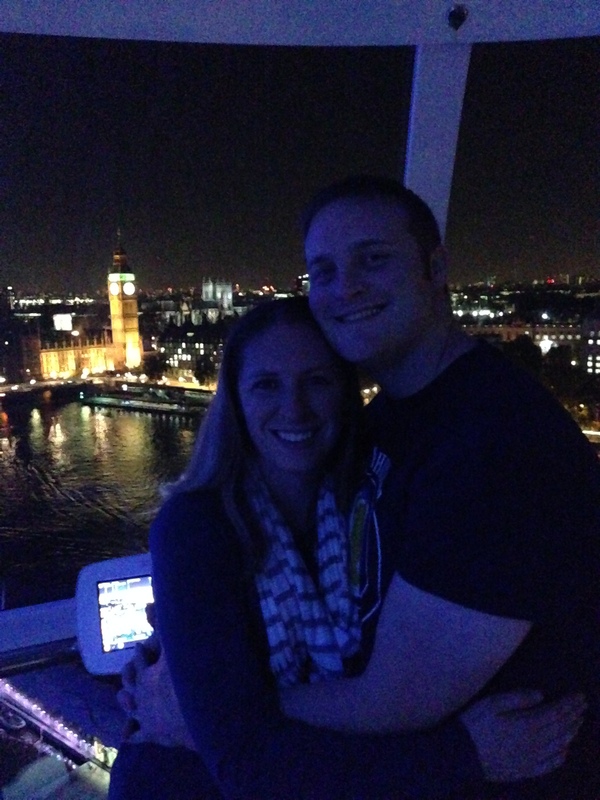 Our favorite date of the entire trip, though, would have to be riding on the London Eye. The Eye is a huge ferris wheel with pods instead of seats. One rotation takes about 45-minutes, so you get to see a lot of the city from a unique perspective. It was so fun to see all of the glittering lights of London as we rode up in the sky. Really spectacular. 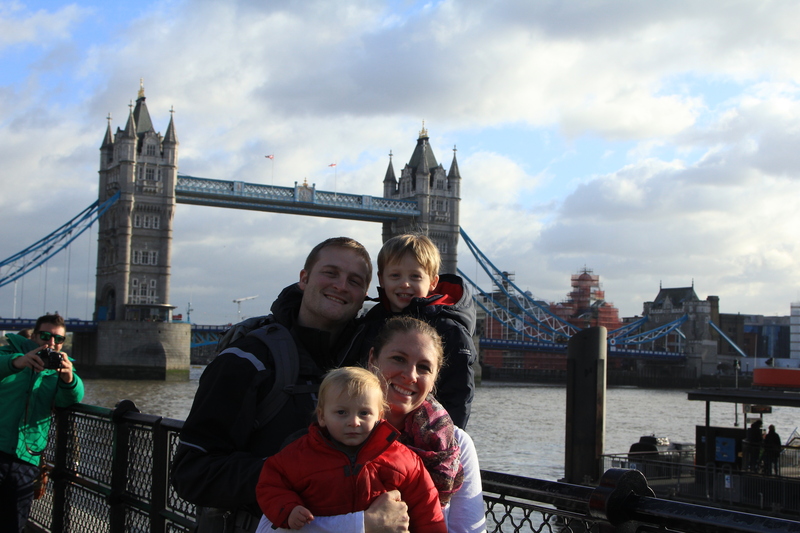 Our last day in London was a free day: all of the attractions we went to were free and open to the public (a notion that we welcomed with open arms after realizing how stinking expensive everything is in London). 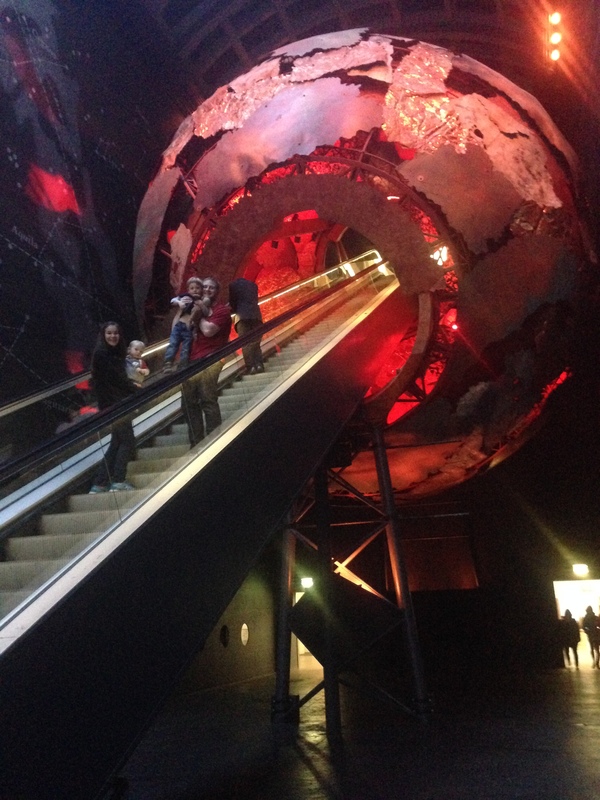 We started the day at the Natural History Museum. It is a HUGE museum with many different sections to explore. 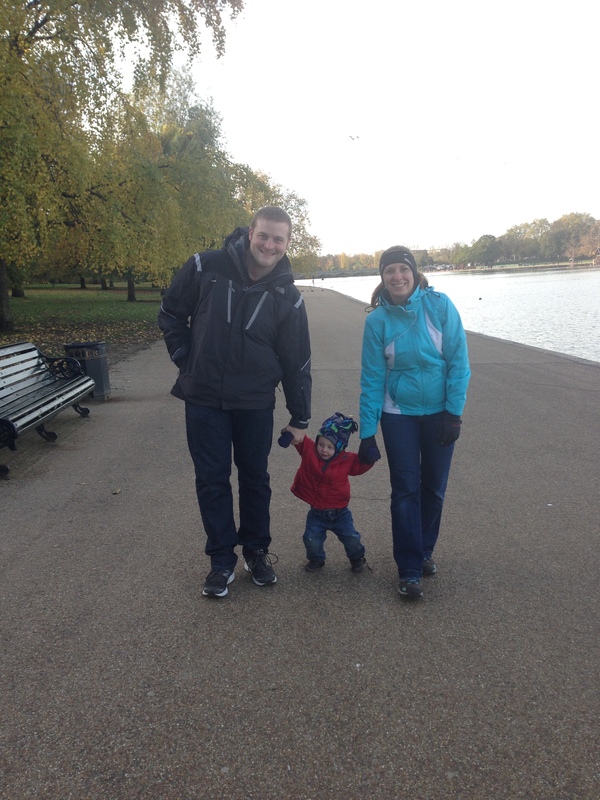 After a few hours in the museum we needed some fresh air, so we headed over to Hyde Park. The boys had fun playing on the playground and throwing rocks in the lake. It was a beautiful day to walk around and spend some time outside. 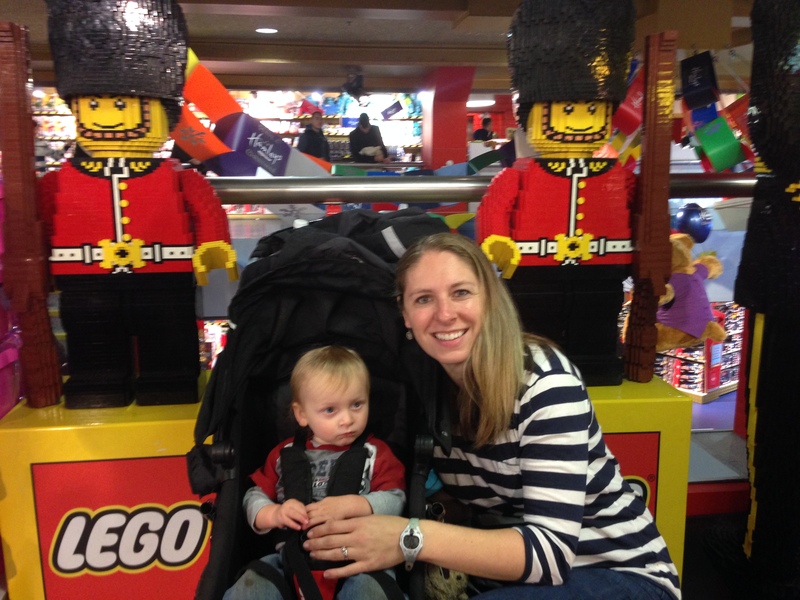 Our final stop of the day was a giant toy store called Hamley’s. It’s 5-stories tall and there are oodles of toys to play with. We ended up spending over 3 hours in the toy store and, sticking to my guns on the whole “free day” thing, we didn’t buy a single toy. The boys were so tired at this point, though, that I don’t think they even noticed. London was incredible, and we all agreed that we must return soon. 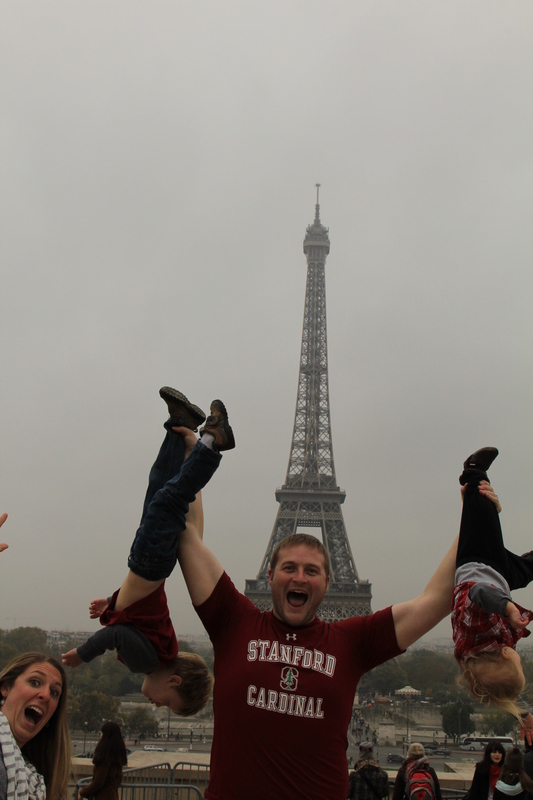 For now, though, it was time to move on to Paris. 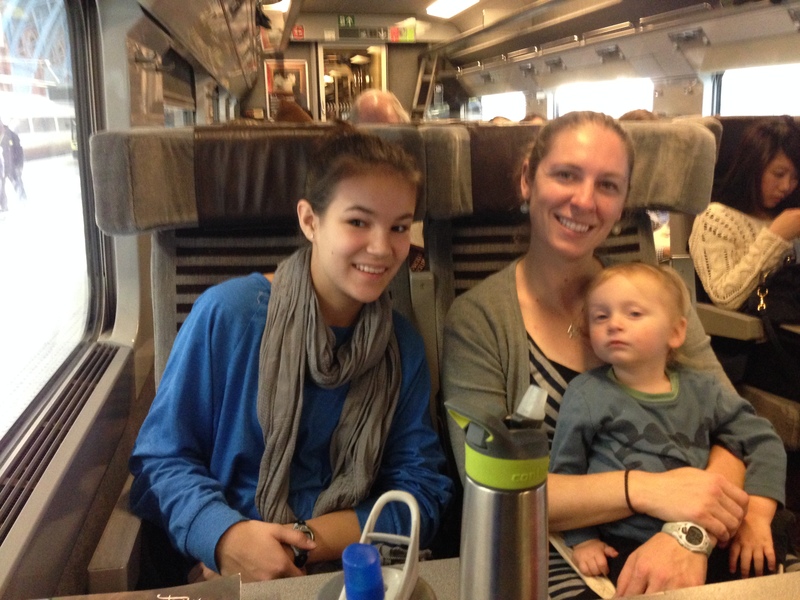 We rode the Eurostar train from London to Paris through the Chunnel. It was a pretty quick ride (less than 2 hours) and I actually didn’t even notice when we went through the Chunnel. I guess we were just going fast (or I was just out of it, which I probably was). The view from the top of the tower is spectacular. It was a bit cloudy on the day we were there, but you could still see for miles. It was amazing being able to see the whole (gigantic) city from one spot. 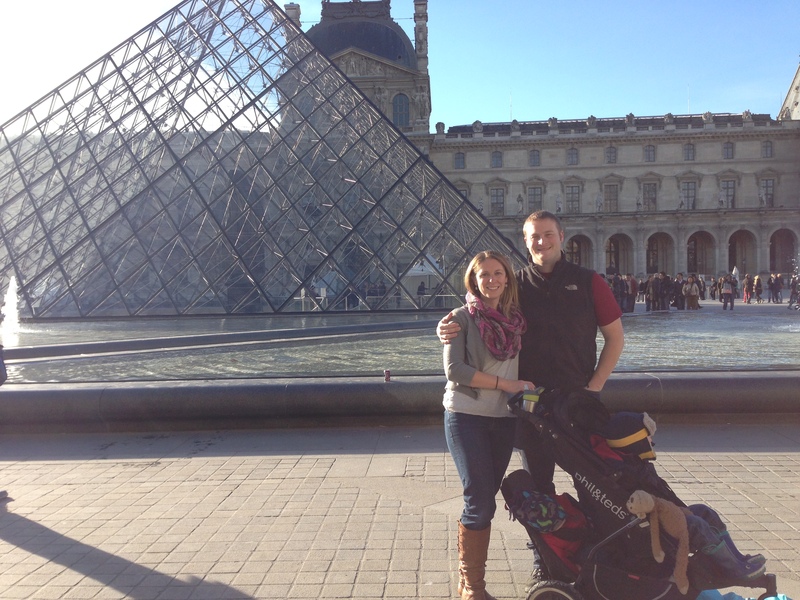 The next day we headed over to another Paris landmark: The Louvre Museum. 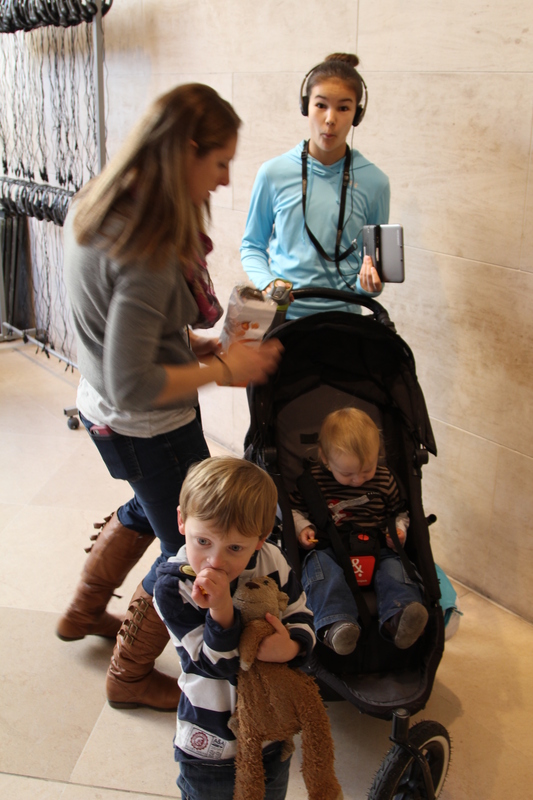 It was, shall we say, interesting navigating an art museum with two small children. But we were determined, and we made it happen. We may or may not have snuck the boys snacks in the “no food allowed” areas, we may have allowed David to watch a movie on the iPad instead of marveling at the world’s greatest masterpieces, and I may have timed our trip so that Jacob was exhausted and fell asleep shortly after our arrival. 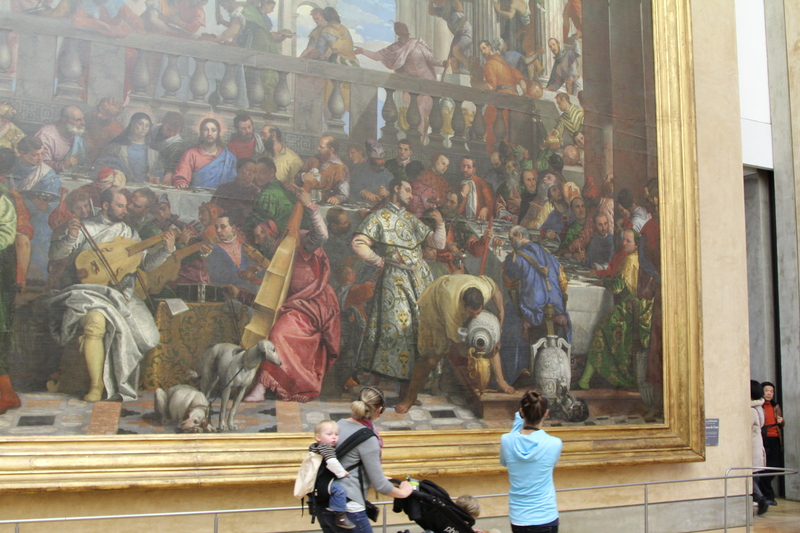 At any rate, we had a successful 3-hour tour of the Louvre. Mona Lisa was interesting to see just because, well, it’s the Mona Lisa. 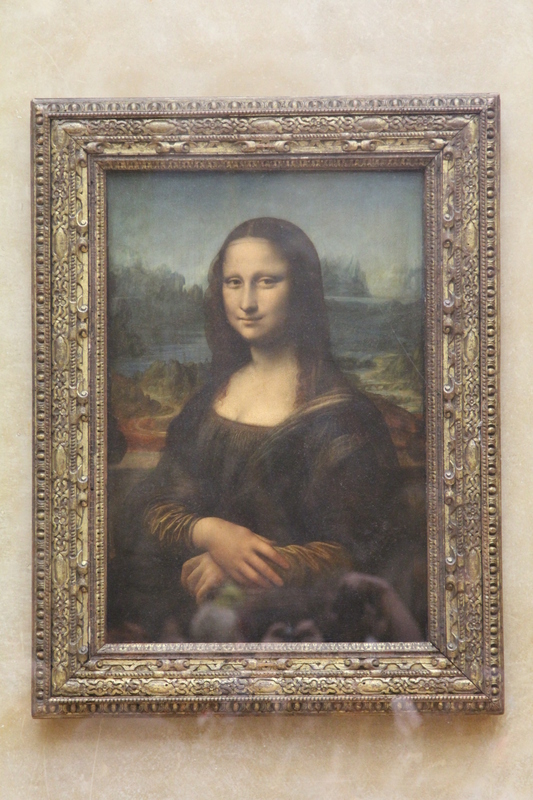 Other than it being famous, though, Mona Lisa isn’t all that impressive. 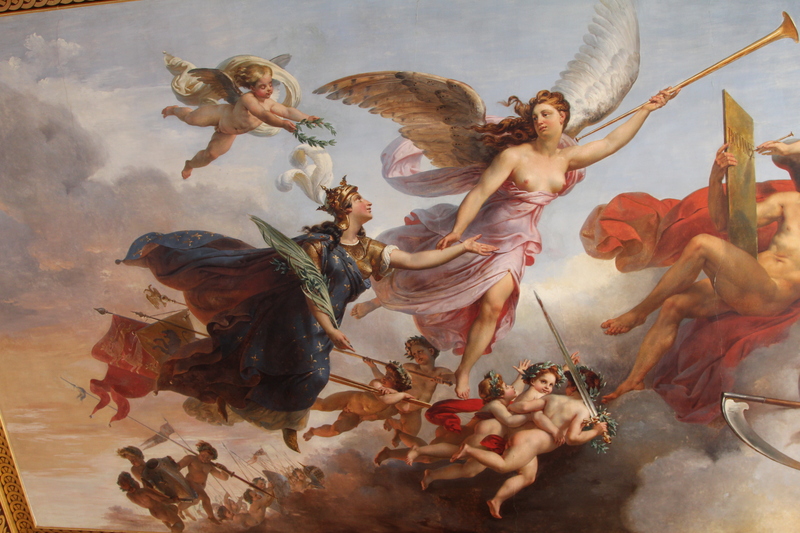 One of my favorite pieces in the whole museum is this painting that is on the wall directly across from Mona Lisa. It’s a HUGE painting of the Biblical scene where Jesus turns water into wine. Standing in front of the painting you feel small, like you are actually a part of the painting itself. It’s all very cool. 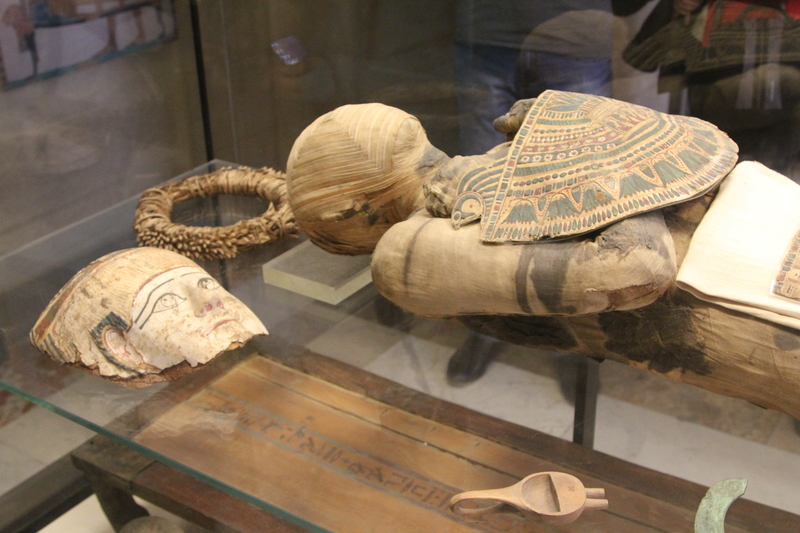 Another stand-out piece in the museum is this mummy. He’s an actual Egyptian mummy, thousands of years old and still fully intact. Craaaaaaazy…. Since we visited the Louvre on a Wednesday, they were open late until 9:30. After dinner we dropped the boys and Jillian off at our apartment so Jon and I could return for some child-free time at the museum. It was great to have a bit of time to wander the halls and not worry about who needed to eat or where we could find a potty NOW. It was also nice to break up the visit a bit–there’s only so much art museum you can handle in one go. 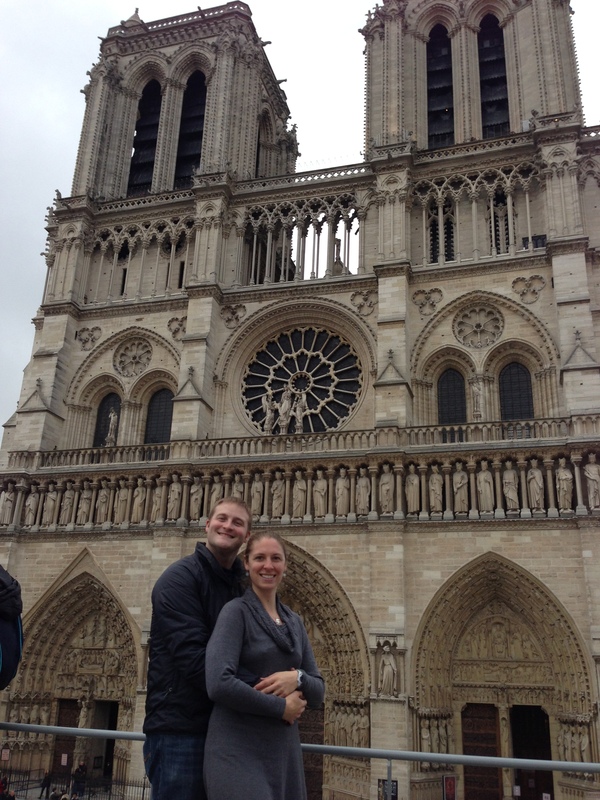 The next day we visited Notre Dame Cathedral. It was every bit as huge and beautiful and incredible as you think it is. We (and by we, I mean me and Jon. No kiddos on this one.) 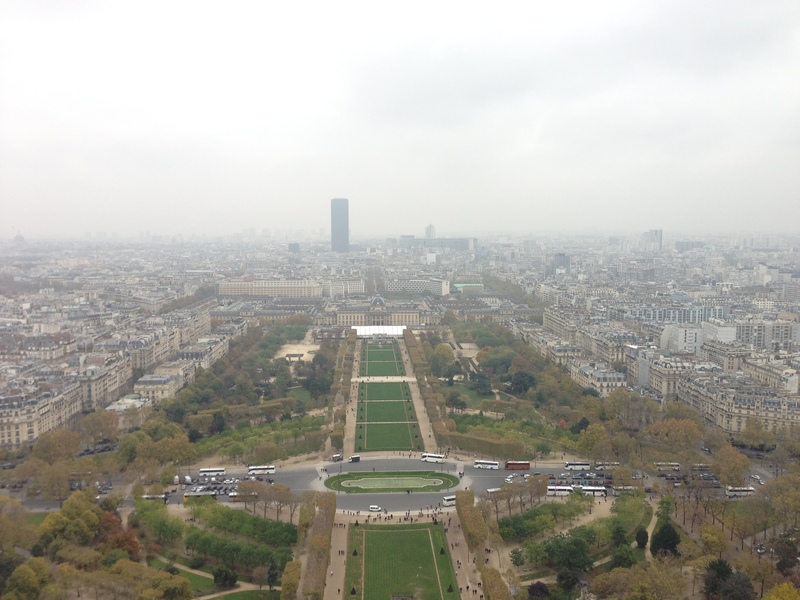 also climbed hundreds of stairs to the top Napoleon’s great monument, the Arc de Triomphe. 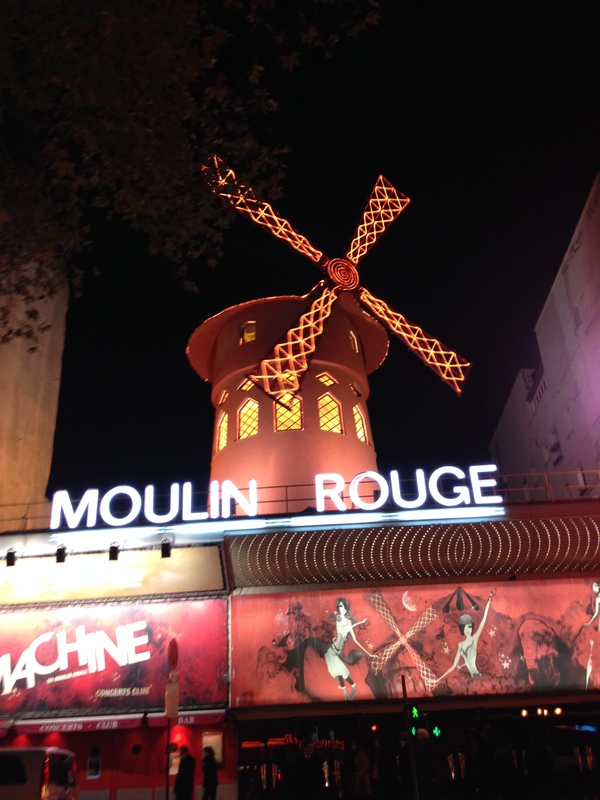 Jon and I also had a date out at the infamous Moulin Rouge. This was both what we expected, and not what we expected. Long story short, you need a reservation (which we did not have), despite offering children’s tickets this is NOT a child-appropriate venue (good thing we left ours at home with Jillian! ), and the show is actually quite spectacular when you get past the risque attire of the performers. 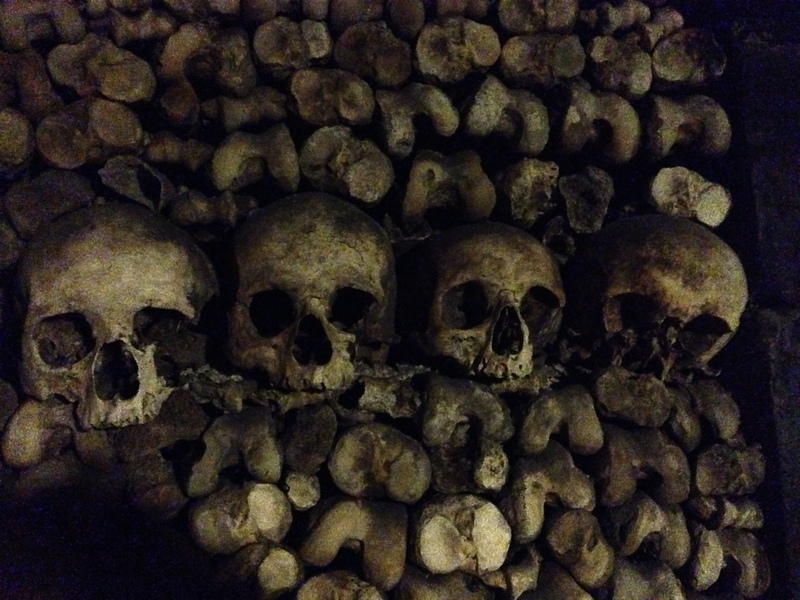 The most unusual place we visited in Paris was the Paris Catacombs. Hundreds of years ago, the Parisians realized that their graveyards were getting full and something needed to be done. There were already miles and miles of underground quarries in the city, so they decided to move all of the bones into the quarries to create the catacombs. The bones are all stacked and arranged beautifully (can you say that about bones?). The catacombs go on for miles through all of these underground passageways–it’s really crazy to see! We spent some time later in the week doing some kid stuff. 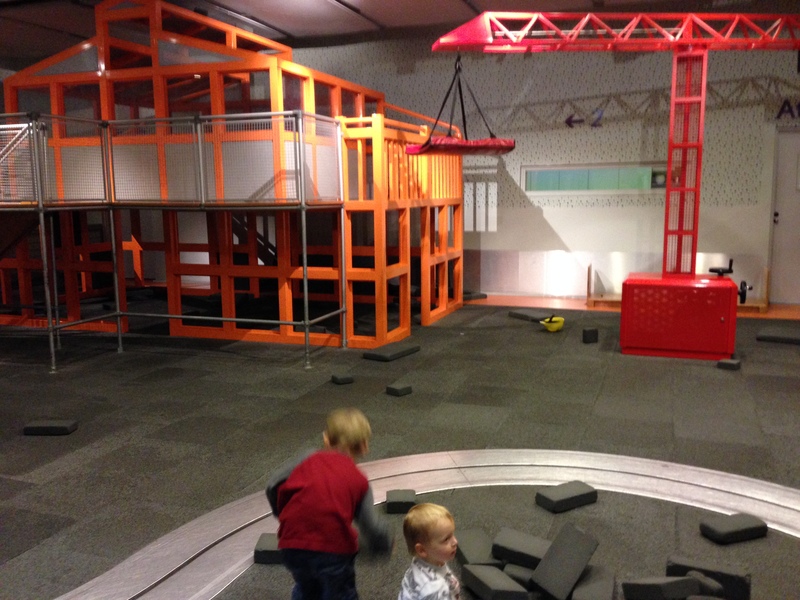 We visited a children’s museum within the City of Science and Industry (a huge complex of museums and fairgrounds). This was an incredible children’s museum, designed specifically for kids aged 2-5, and the boys (my husband included) had a blast! We probably could have spent all week there, it was that good. 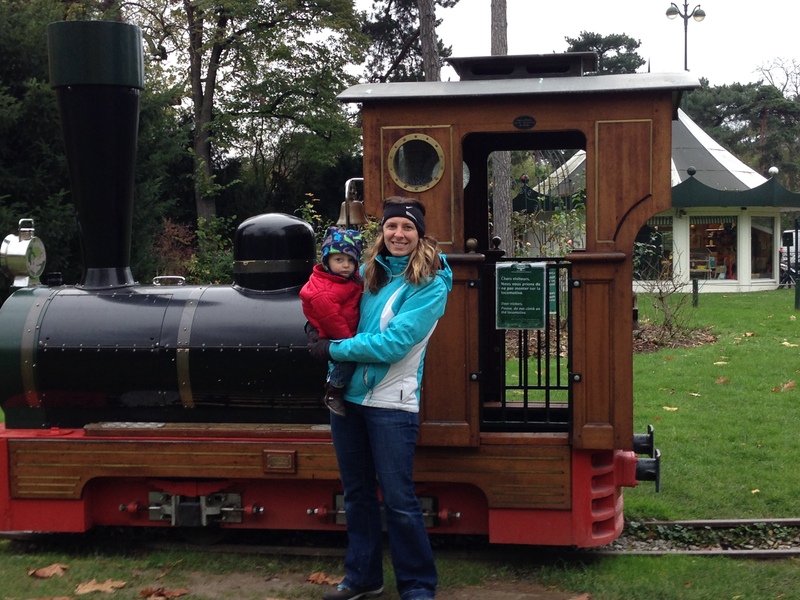 We also went to a huge children’s park called Jardin d’Acclimatation. 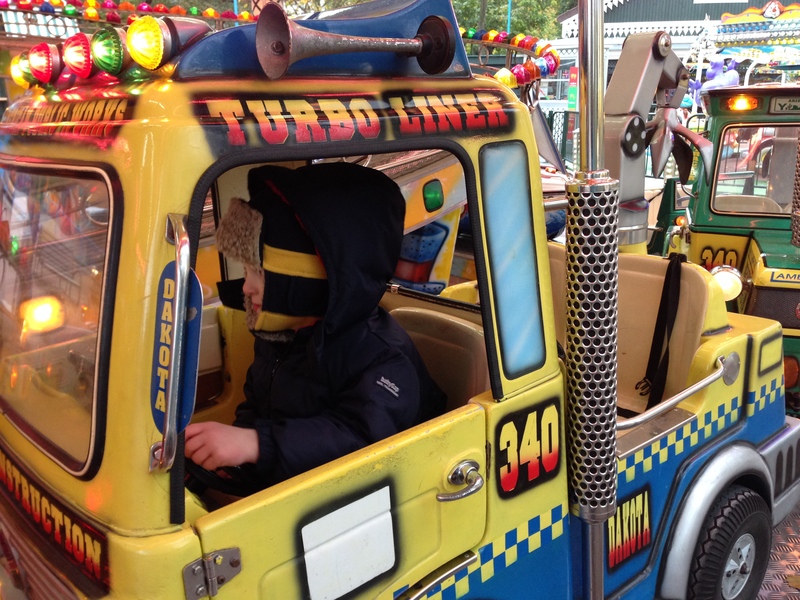 There were animals, playgrounds, a children’s theater, a water park (we’ll have to return when it’s warmer!) and even a little train that you can ride on. 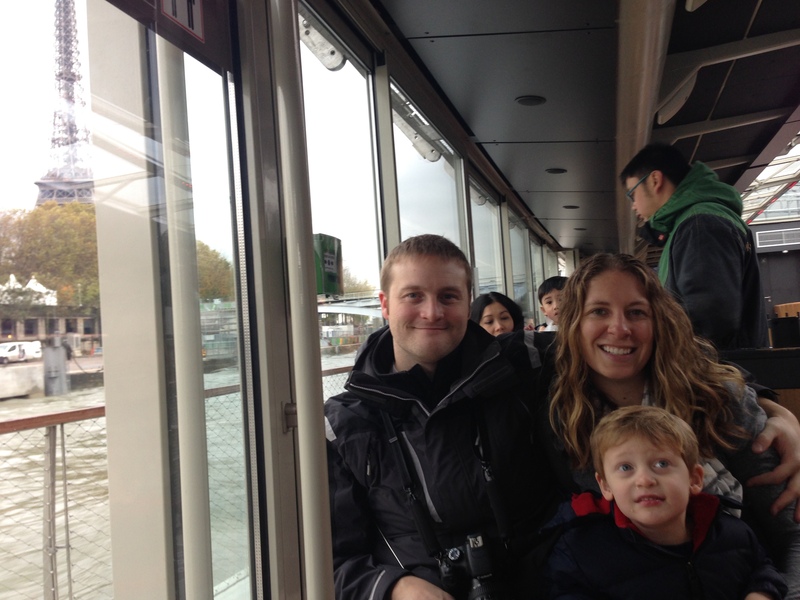 Our final day in Paris was spent taking a River Seine boat tour. 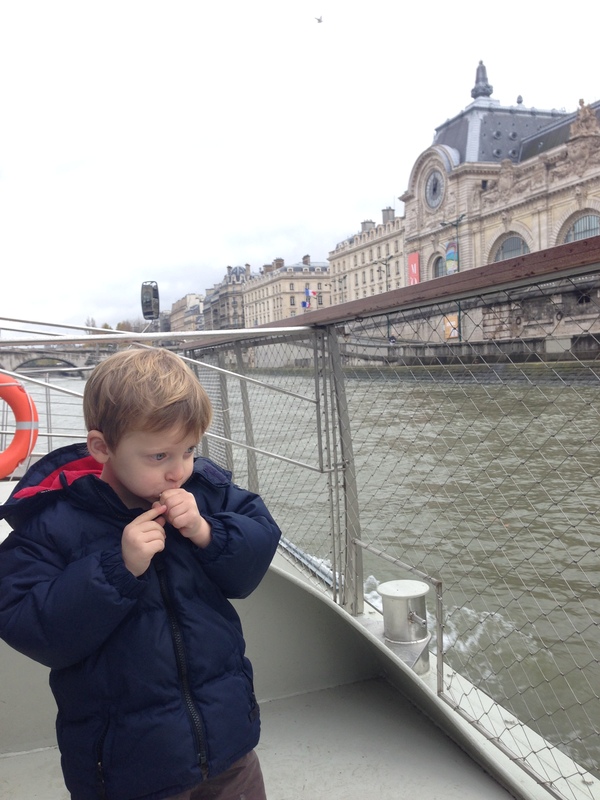 The boat tour took us past all of the famous Paris landmarks and gave us a different perspective on the city. And, then, just like that, our vacation was over. Two weeks flew by at lightning speed–good thing we took (literally) tens of thousands of photos to remember everything! 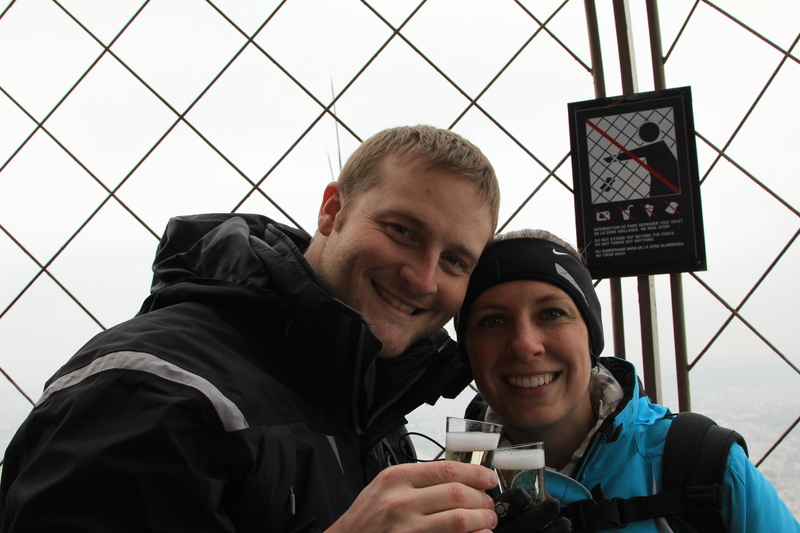 Our time in London and Paris was amazing–so many incredible things to see and do and experience. We will cherish all of the memories of this trip for the rest of our lives. P.S. 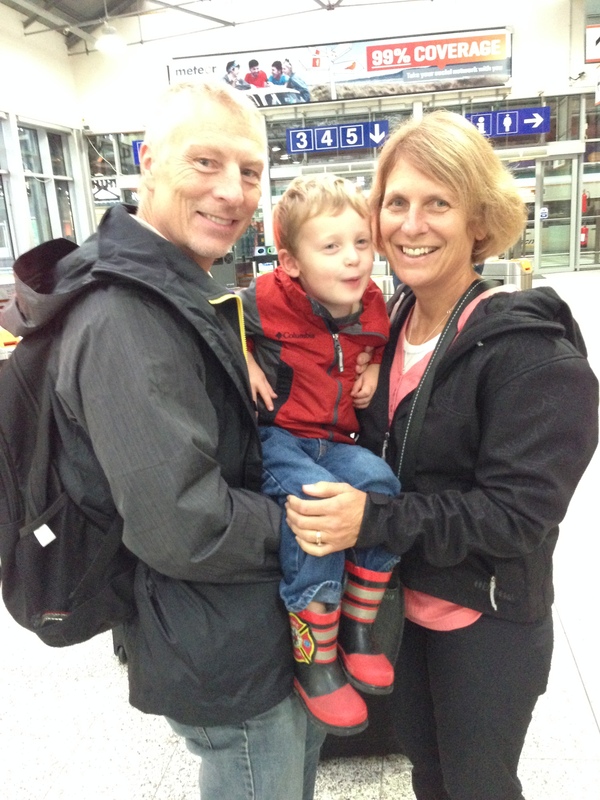 We learned a few tips and tricks for traveling with little kids while we were on this trip. 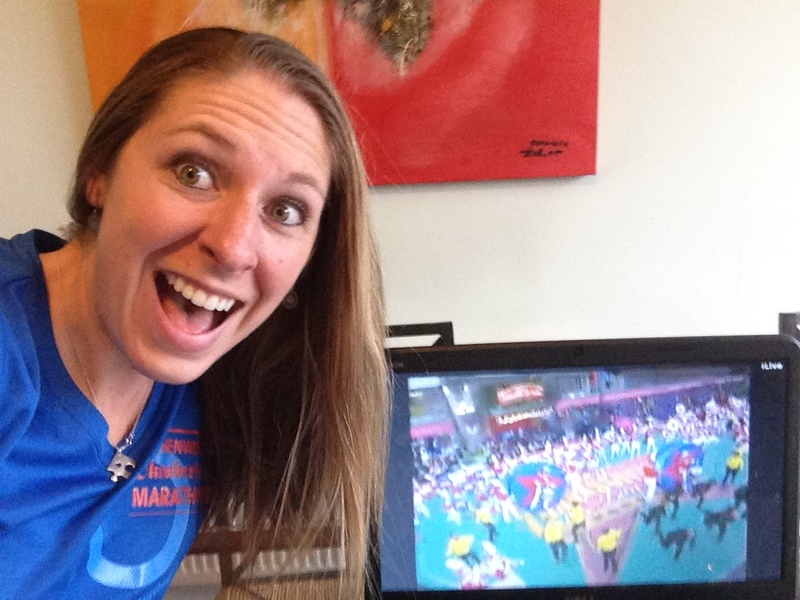 Check out my post here for some insight on how we managed the madness! From there, I just couldn’t stop. Every month during his first year of life we took a photo of David with the sock monkey until, after one whole year, the friends looked like this. Oh, the difference a year can make! Then, last week, he turned 3. THREE! I can hardly believe it. My little baby is now a big boy with his own personality and interests and quirks and thoughts and sense of humor. I love him to pieces. Three is certainly a special birthday–probably the first birthday he’ll actually remember when he’s older–so we had to have a very special birthday party. David is a bit obsessed with the computer game “Angry Birds” right now, so we decided to have an Angry Birds-themed party. While I was on the site, I also printed off some Angry Bird faces that we attached to balloons for decoration, some small angry bird pictures that I attached to toothpicks for cupcake toppers, and a slingshot that we used for one of the party games. This is the first birthday that Aunt Stefanie hasn’t been able to make David’s birthday cake–and I’m no baking brainchild (as in, I’m not patient enough to make those beautiful detailed cakes that I oggle on Pinterest). As a consolation, I told David we could make whatever kind of cupcake he wanted. David wanted red, blue and yellow cupcakes (because those are the colors of his favorite Angry Birds). Done. We took one box of white cake mix, divided the batter into 3 bowls, added a different color of food coloring to each bowl, and baked the cupcakes. After licking out all 3 bowls of cupcake batter it was time for David’s next job: decorating. I frosted all of the cupcakes, set out bowls of sprinkles, and invited David to unleash his artistic side. I can’t remember the last time I saw him this concentrated on a single task. After the cupcakes were decorated we inserted some homemade cake toppers and–TA-DA!–red, yellow and blue Angry Bird cupcakes. And, before he got too covered in frosting, we managed to snap a family photo (thank you to Rachel for stopping everyone and insisting we do this. Somehow I always forget stuff like this!). We were so blessed to have my parents visiting us all the way from Seattle this week to share in David’s special day! After we all filled our tummies, it was time for some fun and games. I found a book that had about a dozen make-your-own Angry Bird masks in it, so before the party David and I put them all together for the kids to wear. Everyone looks relatively happy in this photo, but that’s only because you can’t actually see their faces. The kids were TERRIFIED of the masks. As soon as we started putting them on, the babies started crying and kids were hiding behind their moms. Note to self: the preschool crowd is NOT entertained by face-hiding, person-shifting deception devices like masks. Moving on. One of the kids’ favorite party games is called “Pass the Parcel”. To play, you just wrap a small gift (packets of candy in our case) with wrapping paper, then you wrap that package and another small gift inside another layer of paper, and then that package along with another small gift inside another layer, and so on. 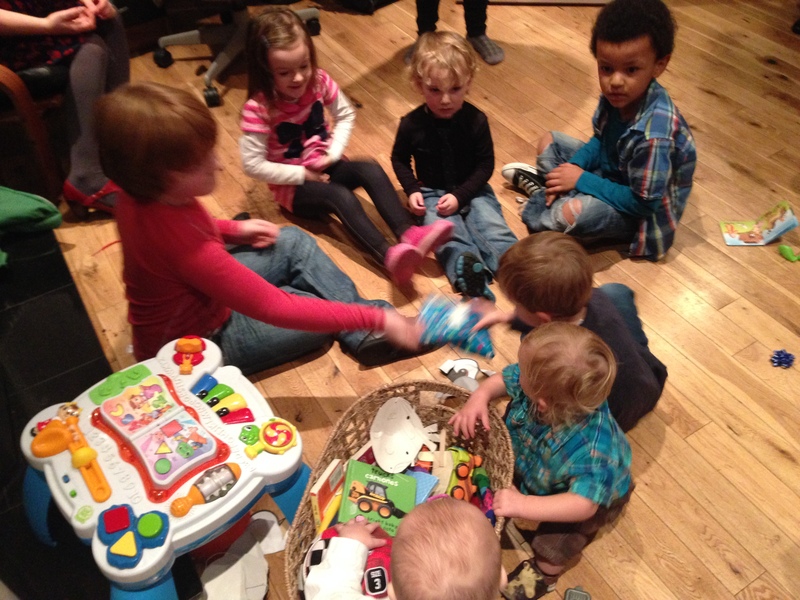 At the party, the kids pass the parcel around a circle while music is playing (kind of like musical chairs)–then, when the music stops, whoever has the parcel gets to open it and keep the gift that’s inside. The game continues until all of the layers of the parcel has been unwrapped (and, if your planning is good, every child walks away with a treat). We also played “Pin the Angry Bird on the Slingshot”. I just printed off a picture of the Angry Birds slingshot and several angry bird pictures, cut them out, and put tape balls on the back of the Angry Birds. Each child got a different Angry Bird and had a turn to try to get their bird in the center of the slingshot (the older kids were blindfolded, but we let the babies cheat a bit). By the time games were over, it was already starting to get late and we moved on to presents. David received so many generous gifts from his friends and family! Toys and games and clothes and movies–incredible. And he really did appreciate them–it was awesome to see David go up to each friend and thank them for their gift after it was opened. It was a truly memorable birthday. I am so grateful we could celebrate this milestone with so many loved ones, near and far. David: you are my sunshine and, no matter how big you get, you will always be my baby. Happy 3rd birthday, little David! My parents just came for a visit (read all about it here) and, while they were here, Jon and I managed to sneak away for a couple of days to enjoy some time together. Since our time alone is so rare, we wanted to do something that would be best done without our kids. 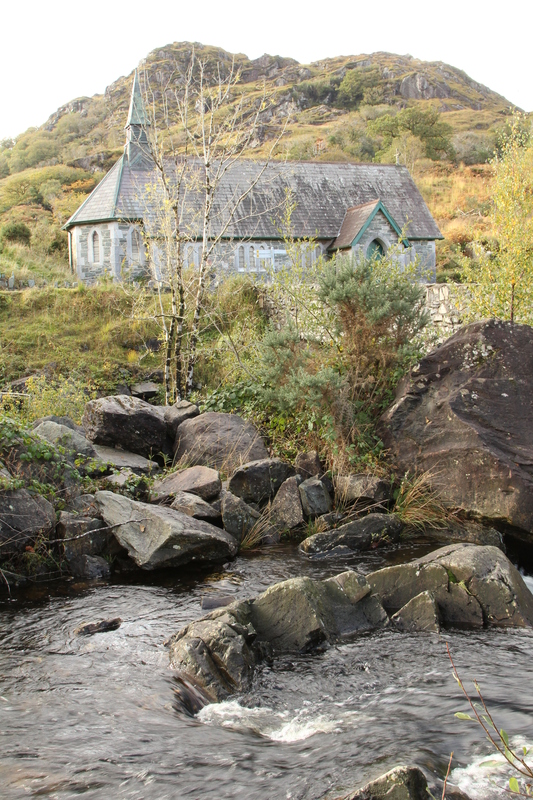 We’ve really been wanting to drive the Ring of Kerry, a scenic tour along Ireland’s coastline. We knew that the boys would go berserk sitting in a car for 8 hours while we marveled at the natural beauty surrounding us so, it was decided, on to the Ring of Kerry we went sans children. 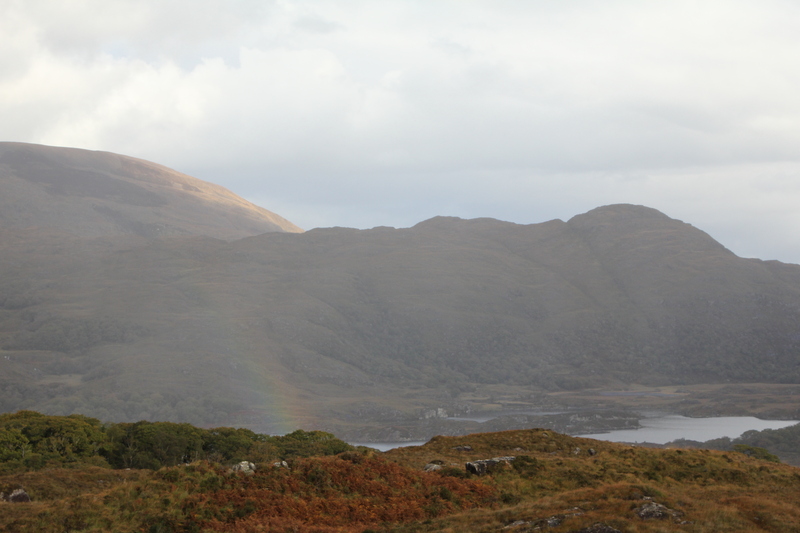 We drove up to Killarney the day before our self-guided tour so that we would be able to get an early start on driving “The Ring” the next morning. Killarney is a cute little town with lots of pubs, restaurants, shops and Victorian-era hotels. We stayed at the Arbutus Hotel right in the middle of town. It was a charming family-run hotel that has been passed down from generation to generation. 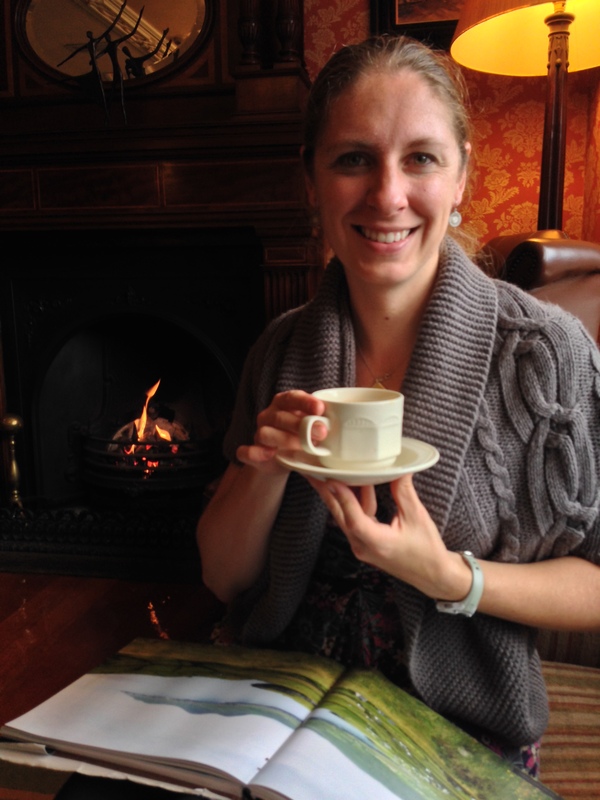 When we checked in we were greeted with tea and warm homemade gingerbread by the fireplace. It was so warm and cozy and…quiet. After a nap–because, as any parents of young children know, sleep is the most precious thing you can get on vacation–we went out to explore town. We did a little shopping, went out for dinner, and visited a few pubs to listen to some trad (traditional Irish music). We didn’t stay out too late, though, because tomorrow was going to be our big day of driving The Ring and we’d need to get an early start. The next morning we had a delicious breakfast at the hotel before heading out to The Ring. We followed Rick Steve’s Guide to driving the Ring of Kerry so we actually drove in the opposite direction of the tour buses. Since we were there during the off-season, there was very little traffic and we were able to pull off at every scenic pull-out that we wanted to see (which just so happened to be every scenic pull-out). Our first stop was a waterfall that was a short hike off the road. It was raining so we didn’t want to bring the big fancy camera on our little escapade into the woods but, trust me, it was beautiful! I think that if we make it out this way again we will bring our hiking boots and just do some hikes–there are miles and miles of trails leading to the most incredible sites! Even the boys would have fun romping through the woods. And this is a castle on somebody’s private property. There was actually a “For Sale” sign posted nearby, so I’m wondering if we could actually buy some land with our own little castle. Best Irish souvenir ever! Next stop was the Staigue Ring Fort (so called because of it’s circular shape). 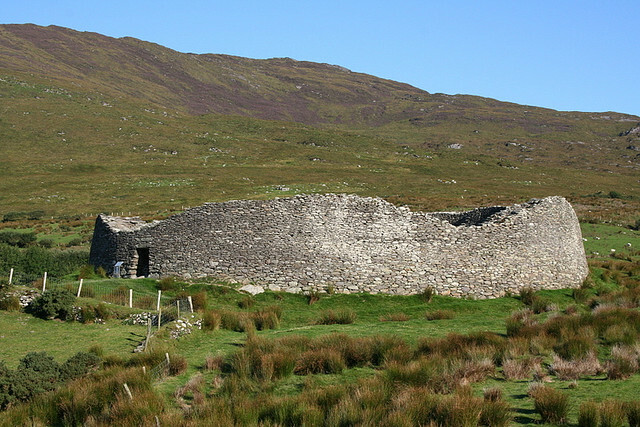 Staigue Fort was built somewhere around 300-400 AD but historians don’t know the exact purpose of why it was built or who built it. 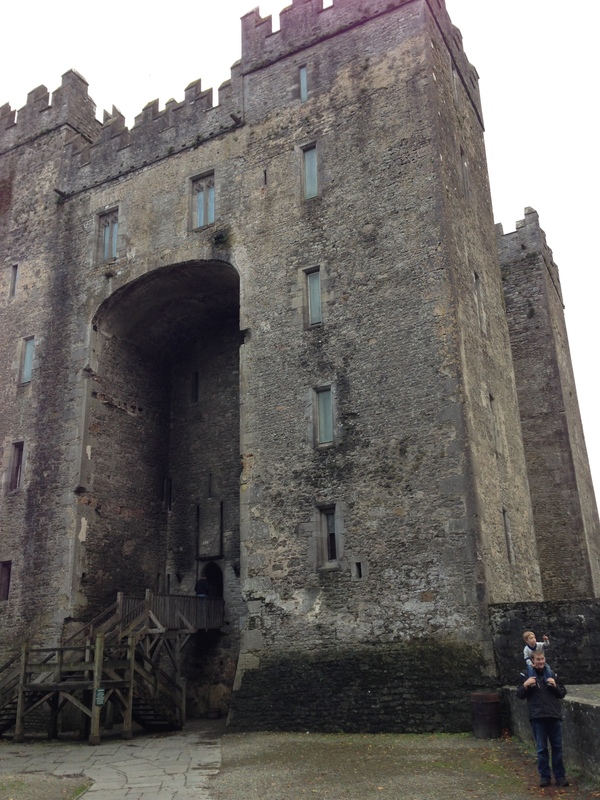 The fort was quite impressive with 13-foot thick stone walls and two little chambers that you could walk inside. It’s amazing to me that something that was built 1700 years ago–with no mortar and only the most basic of tools–is still standing right where it’s original builders left it. 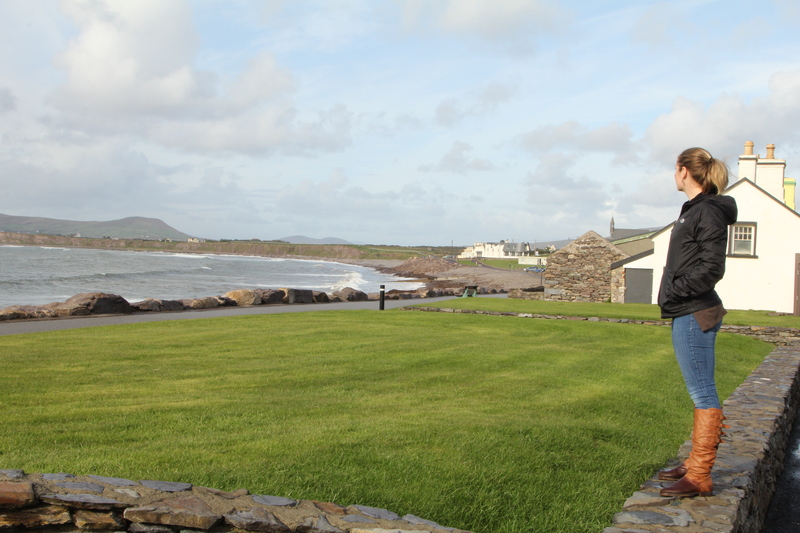 From the Ring Fort we continued on to a vista of the Skellig Islands and the Skellig Experience Visitor Center. These two islands have quite the history. 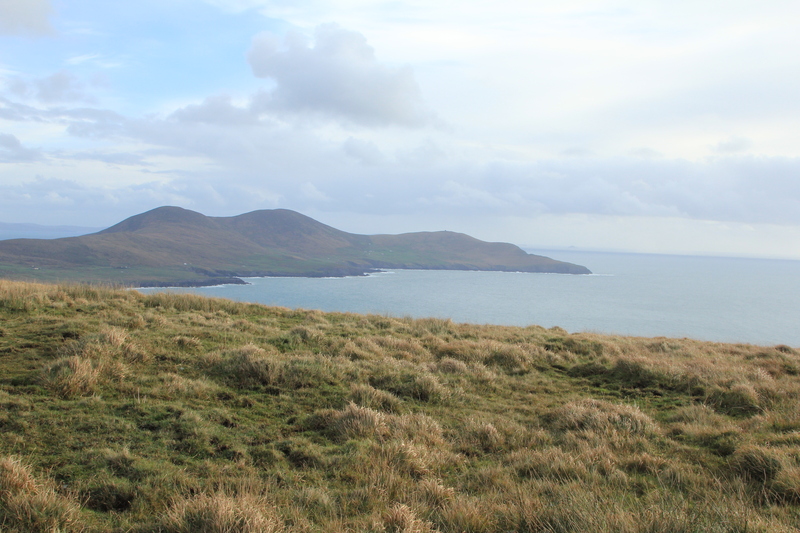 The smaller island, Little Skellig, is home to one of the world’s largest seabird colonies with over 30,000 pairs of Gannets (and, I’m guessing, one of the largest piles of guano in this hemisphere). 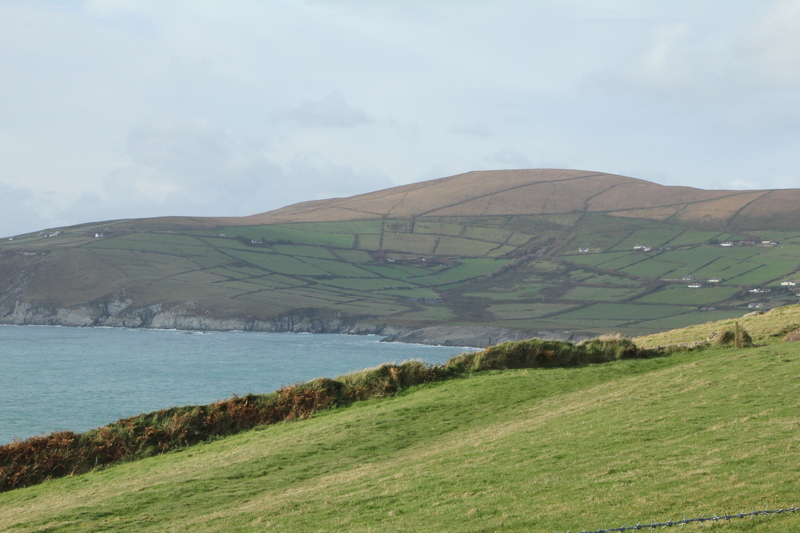 The larger island, Skellig Michael, is the site of an ancient monastic settlement. Some time in the 6th century monks sailed the 12 miles out to Skellig Michael and labored to create stone huts and thousands of hand-carved stairs into the mountainous terrain. Despite four Viking raids and being in the middle of the Atlantic Ocean for 1400 years, the entire settlement is still in tact. During the summer months, visitors can actually charter boats out to the Skellig Michael and walk around the ancient huts and chapels where the monks lived and worshiped. Again, I am impressed. 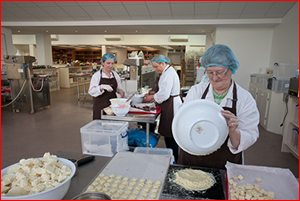 Another must-stop attraction near the Skellig Islands is the Skellig Chocolate Factory. This has to be the most remote chocolate factory in the world, but the quality of their chocolates means that people are still willing to drive hundreds of miles to get a taste. We went into the factory for their free chocolate taste testing, and we ended up spending a small fortune on chocolates to take home to get us through the long Irish winter ahead. Continuing along the road our next stop was the town of Waterville. Waterville was home to Charlie Chaplin and his wife for a time, so there are several statues and mementos dedicated to the silent film star in town. We pulled over here for some lunch (sub-par food) and a walk along the ocean (phenomenal). 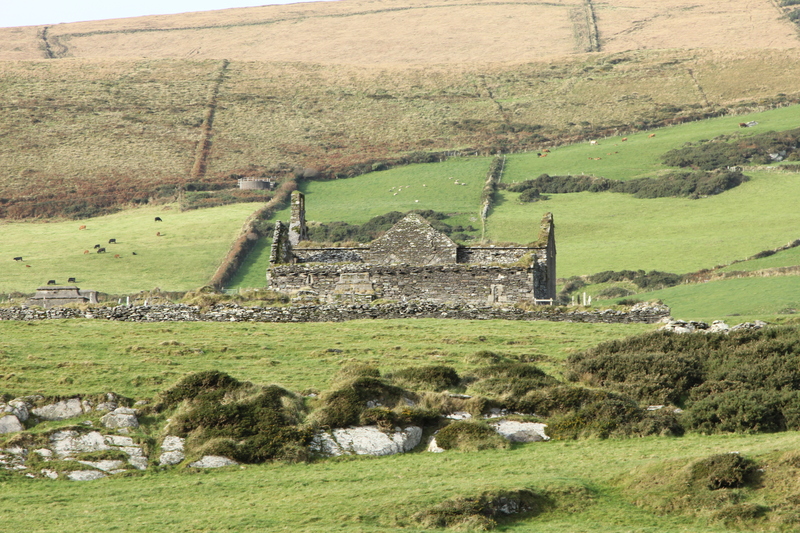 We drove by several “famine villages”–houses and farms that were abandoned in the countryside during the Great Irish Famine of the mid-1800’s. There were hundreds and hundreds of these abandoned houses in Kerry, so it really gave us a picture of the devastation that the Famine must have brought this region. By this time we’d been driving on The Ring for over 7 hours and our daylight was starting to wane. Luckily we had already seen all that we came to see and it was time to head back for home. 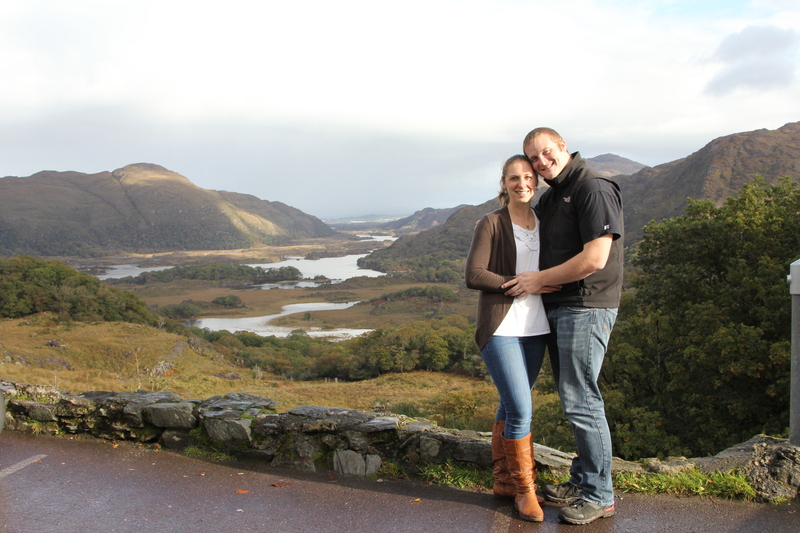 We had a wonderful time enjoying the natural beauty of Ireland and spending some quality time together. And now, after a glorious mini-vacation, we are gearing up for our first-ever BIG family vacation! On Monday we leave for two weeks in London and Paris. Bon Voyage! I just had the most amazing two weeks with these two: my mom and dad (or, as they are better known around this house, Nana and Papa). 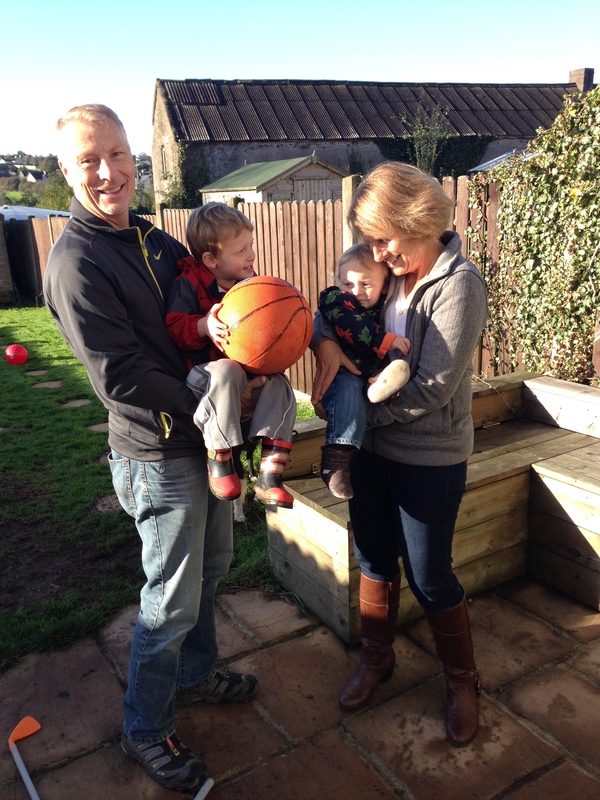 I can’t even begin to tell you how wonderful it was to have them here–to hug them, to show them our new home, to explore Ireland with them, to marvel together at how quickly my boys are growing, to introduce them to our new friends, to laugh with them, to have conversations that are not only between the hours of 3 and 9 PM (which happen to be the only times that we’re all available with time zone differences). It was…incredible. And I never wanted their time here to end. But, alas, the time has already come and gone. Now all we have are the memories…and lots of photos. LOTS of photos (we’re talking in the tens of thousands here, folks). So, I’ll try to do their visit justice with this little (read: LONG) photo diary of our adventures together in the Emerald Isle. 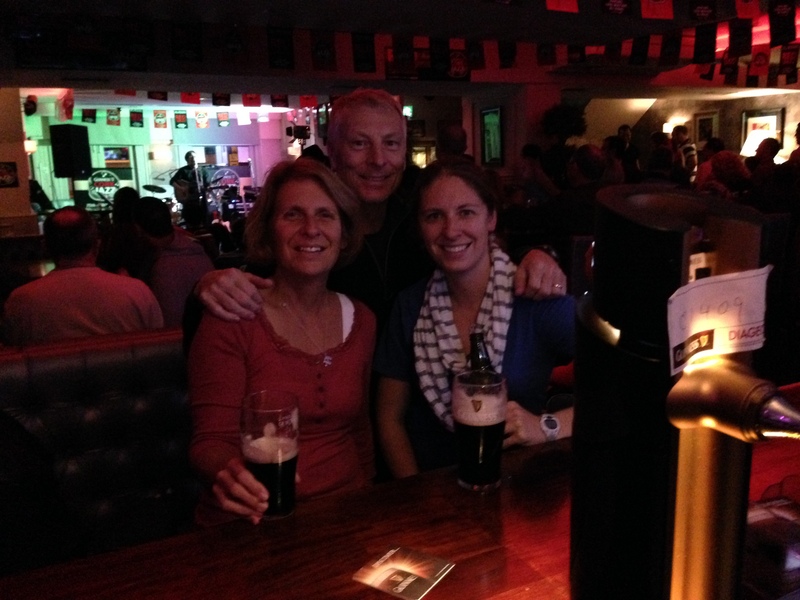 Mom and Dad flew in to Dublin and spent a couple of days there exploring the capital and celebrating their 35th(!) wedding anniversary. I love that they are still in love and that they always keep things new and exciting in their lives. 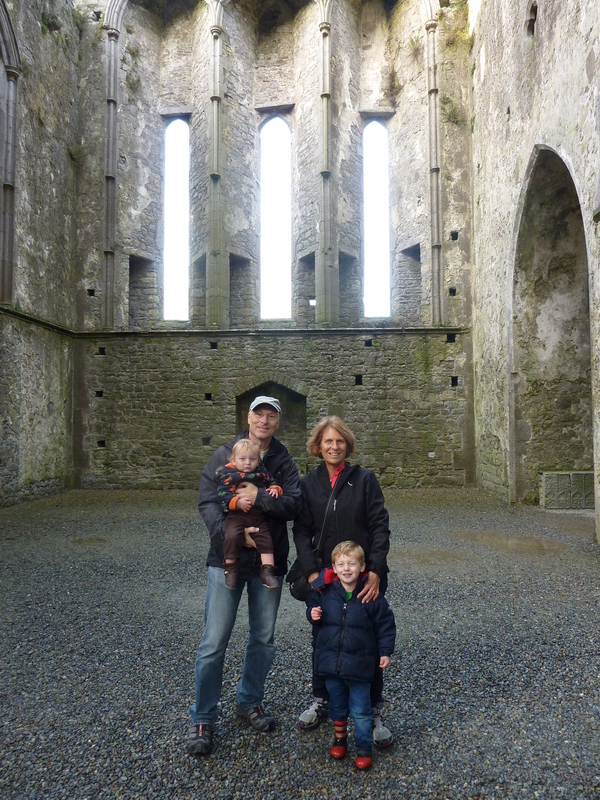 Although they have traveled all over the world, neither of them had ever been to Ireland before. It was my mission, then, to win them over to this beautiful country. 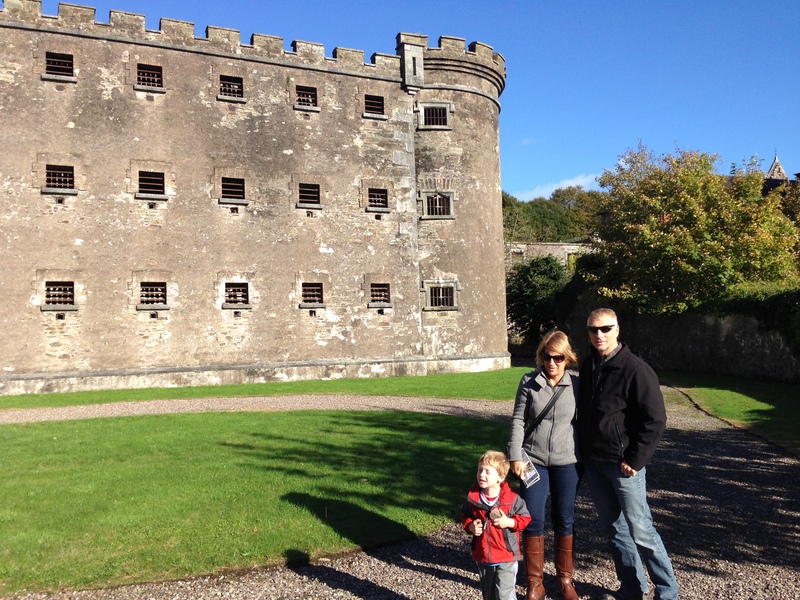 For our first full day together, I took them on a whirlwind tour of Cork City, the real capital of Ireland. We started at the old Cork city gaol (jail)…not because I wanted to send any subliminal messages, but because I had already purchased a Groupon voucher to use there and I wanted to make sure we got to it before the boys got cranky (which is basically any and every time after they’ve woken up in the morning, so I don’t know why I even try). The gaol is a beautiful 200-year old building with a colorful history. We got to walk through the hallways where the guards would have kept watch and even go inside the cells where the poor miserable inmates would have worked away their sentences. Let’s just say I was glad we had the freedom to leave that place when we were ready! 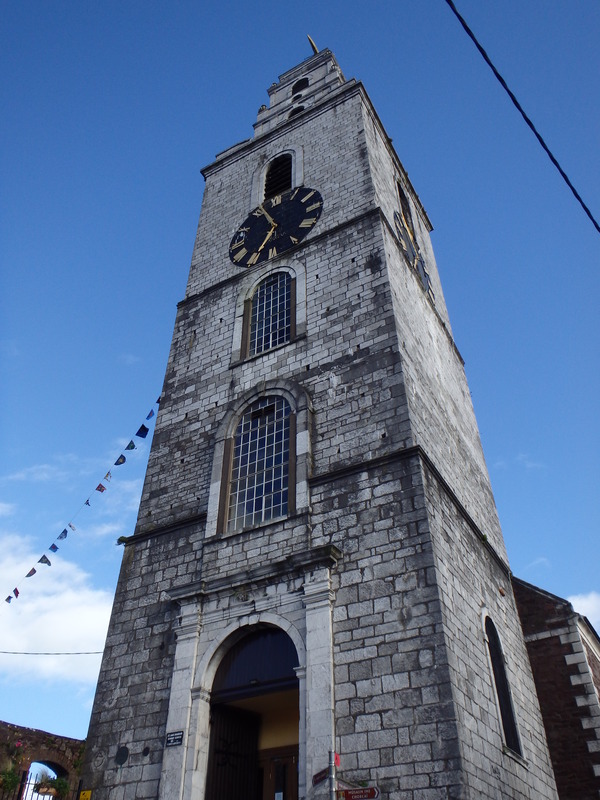 After exploring the gaol we went to another part of the city called Shandon. 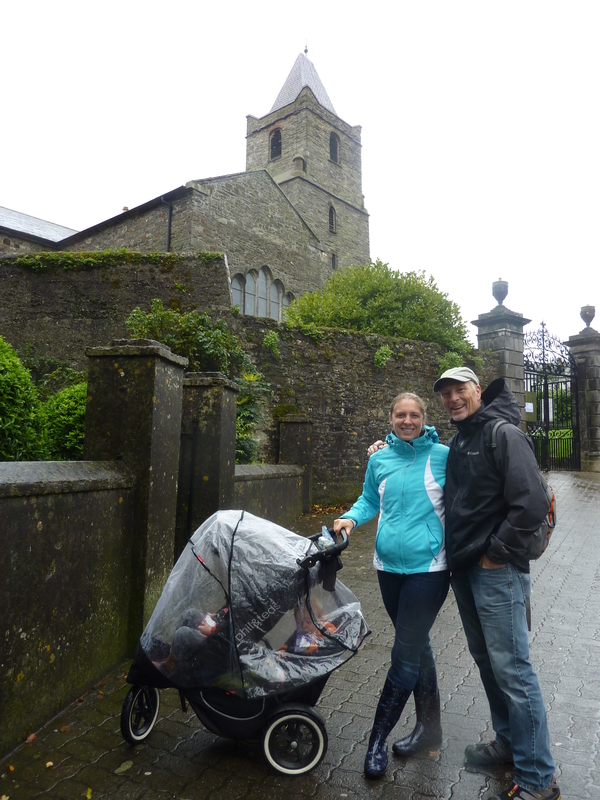 We hiked up a big hill to St. Anne’s Church, home of the famous “Four-Faced Liar” clock and the ever-ringing Shandon bells. We played a few songs on the bells (yes, they let anyone who pays the 4 Euro admission price ring those giant church bells to their little heart’s content) and then we climbed the steep, spiraly, claustrophobic stairs all the way to the tippy-top of the tower. 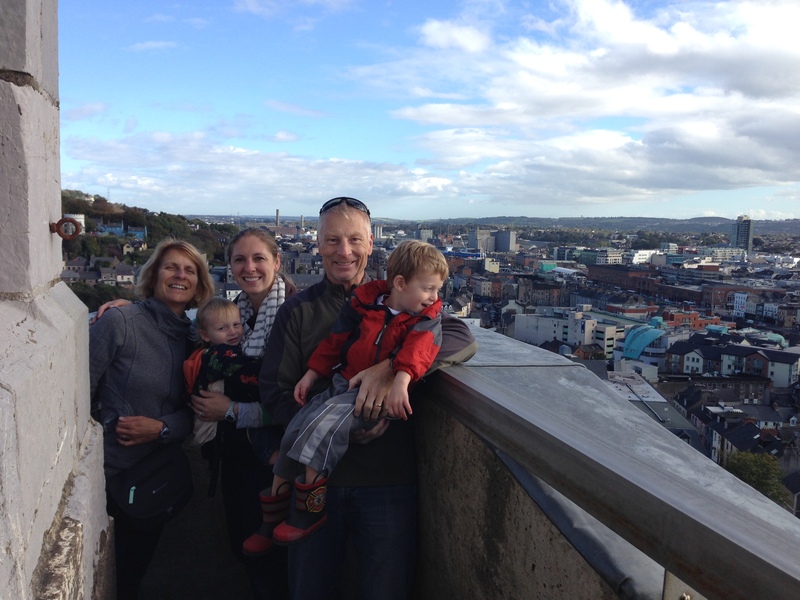 When we got to the top of the tower we were rewarded with a gorgeous panoramic view of Cork city. Definitely worth the precarious journey. Once we got our feet back on solid ground, it was time for some lunch and shopping. 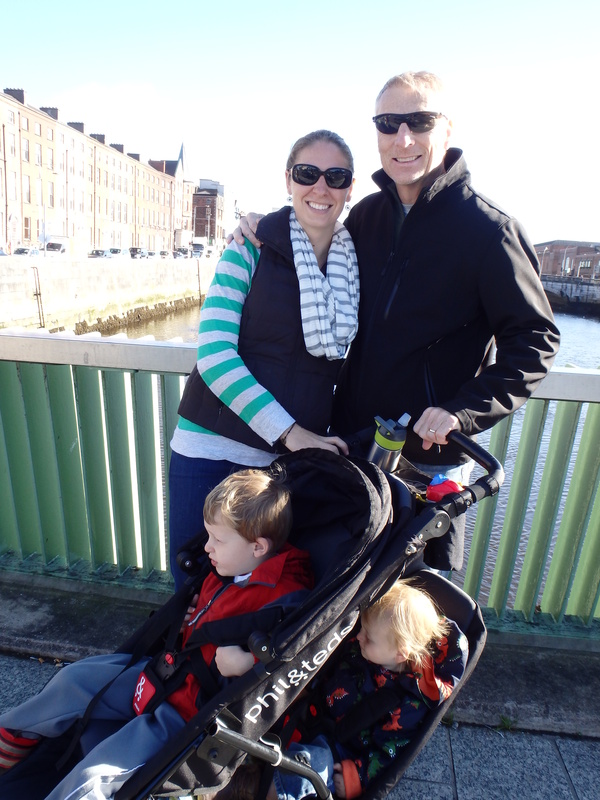 We strolled through the city and crossed one of the many bridges that cross the quays (wharfs) that divide the city. This was about our (and by our, I mean the boys’) limit for the day so we called it quits and headed back for a quiet evening at home. My parents are both avid runners. I always feel a bit like a lazy slob when I’m around them because they’re up at 7 AM every morning lacing up their running shoes before I’ve even rubbed the sleep out of my eyes. I happen to have a few favorite runs around here, though, so I was ready for them. After we dropped David off at preschool on Thursday morning we went down to the pedestrian path that goes along the waterfront. Since my dad is the fastest, I made him push Jacob in the stroller (nothing like pushing a baby through a head-wind to even out the pacing!). 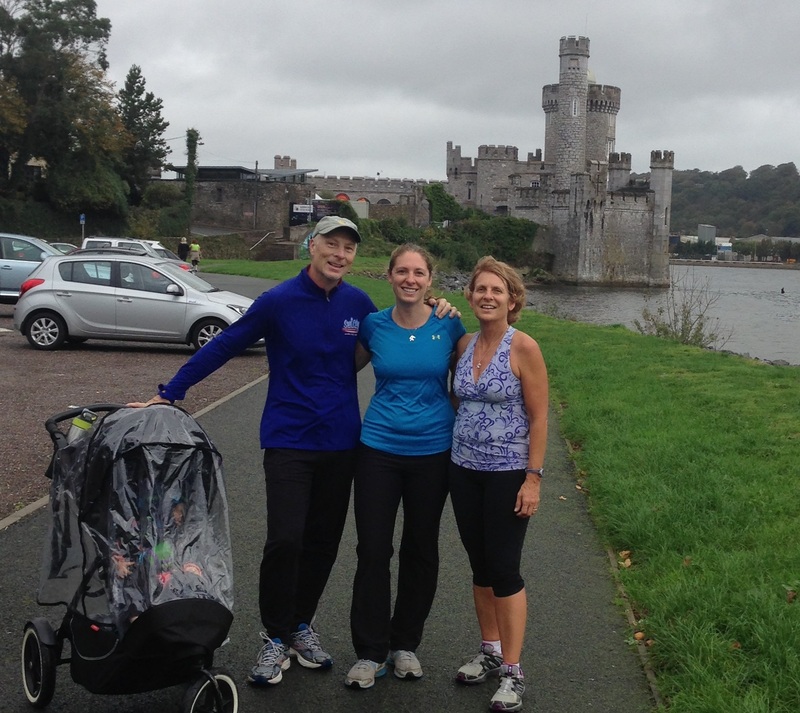 Our turn-around point on this run was Blackrock Castle (and, like me, they were adequately impressed at being able to run to an actual castle). 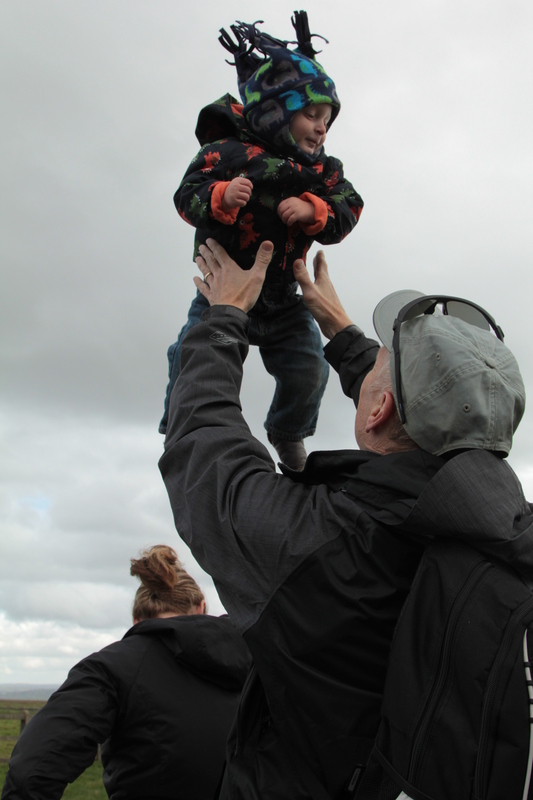 As you can tell from the plastic-wrapped baby in this photo, it started to rain a bit on our return trip. All the more reason to run faster all the way back to our car! Now, since we all needed something worthy of posting to Facebook, we decided to go out and listen to some local trad (Irish music) downtown. Unfortunately for us there was a jazz festival going on that night so every SINGLE pub in town was featuring jazz musicians. No trad for us, but we did get some pints and some good music after all. Jon was actually able to take a few days off of work while my parents were visiting so we took a couple of bigger day trips while he was with us. 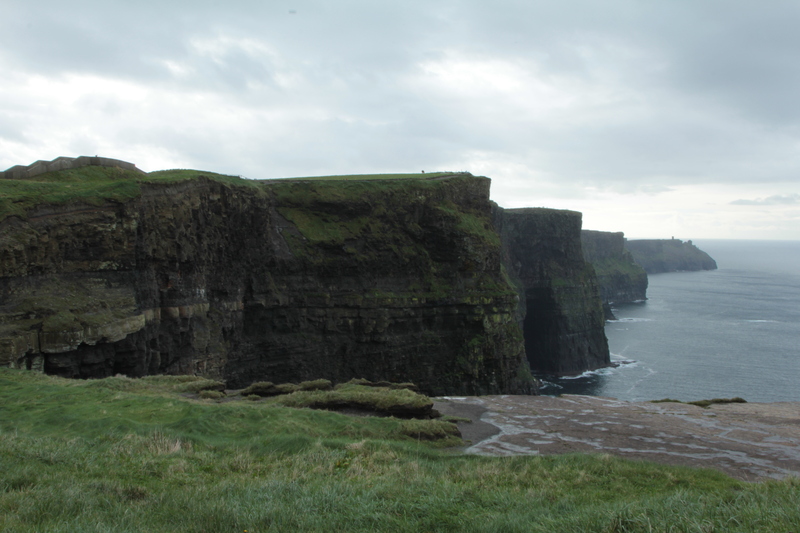 The first outside-of-Cork trip we did was to the Cliffs of Moher on the western coast of County Clare. 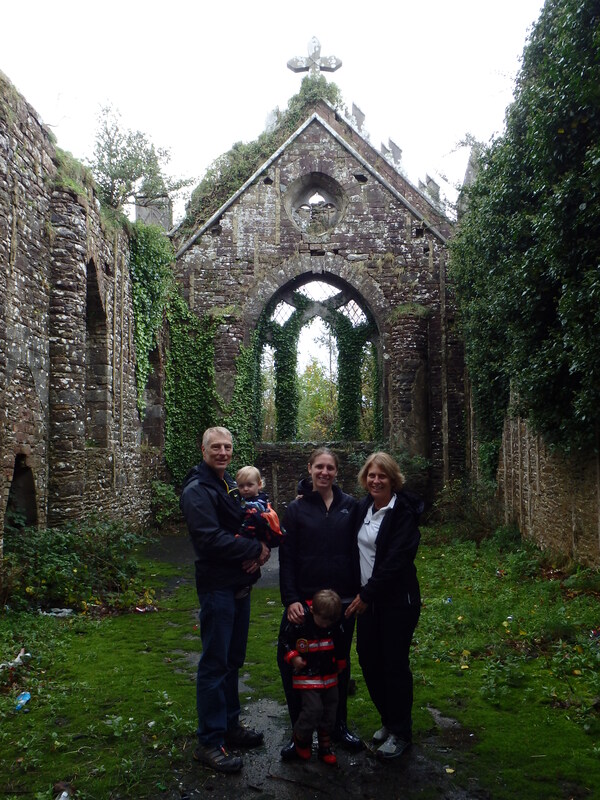 On our way up to the cliffs we came across this beautiful old abandoned church. We got out to stretch our legs and snap a few photos before continuing on. 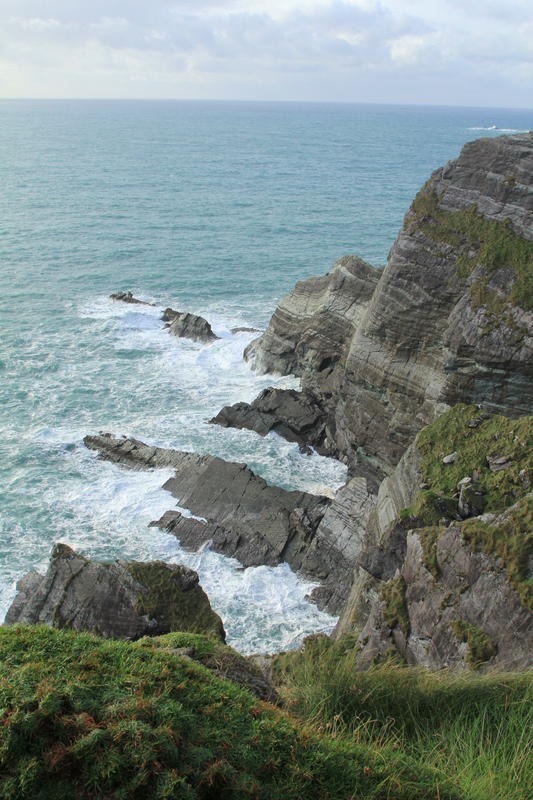 The cliffs are one of the most dramatic natural sites I’ve ever witnessed. Truly magnificent. Note: I should have just let him swim in the giant mud puddle because about 20 minutes later he FELL in an even BIGGER puddle and had to get showered off in a public restroom. Yes, that’s right. 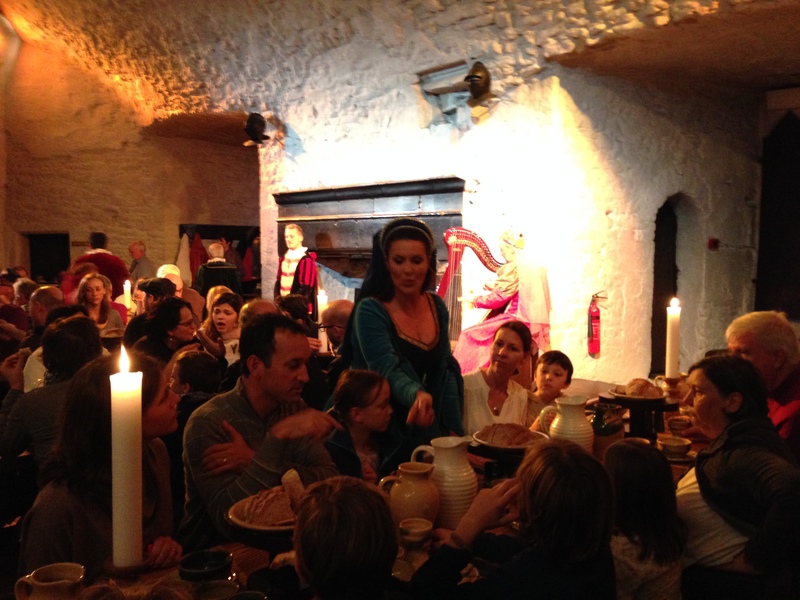 A medieval banquet. I know it may sound cheesy (ok, I KNOW it sounds cheesy!) but it was so much fun that I don’t even care. 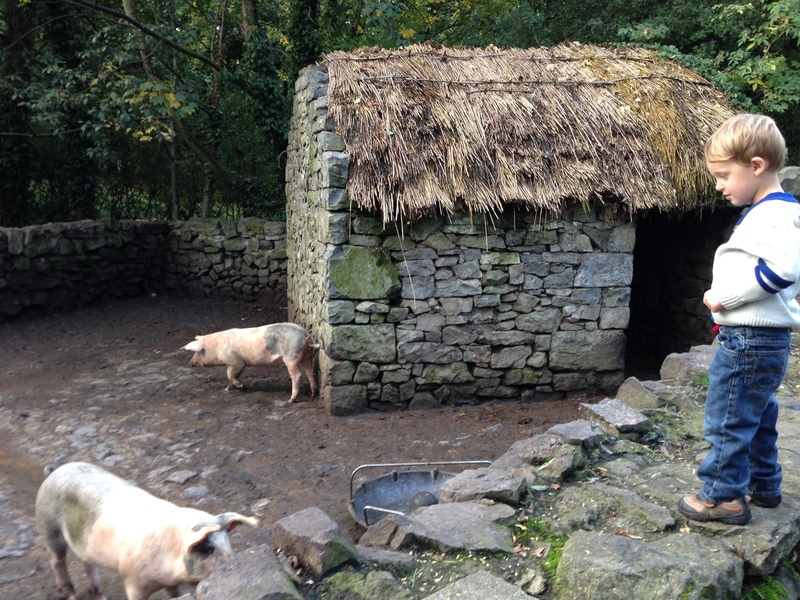 Actually, I think this is one of my favorite things that we’ve done in Ireland. After we all had sufficient mead it was time to go downstairs to the banqueting hall. We were all seated at long tables (except our family, who they sat in a secluded table away from the other paying customers. I wonder why…). There was much music and merriment. We were served course after course of delicious food (and bottomless wine. 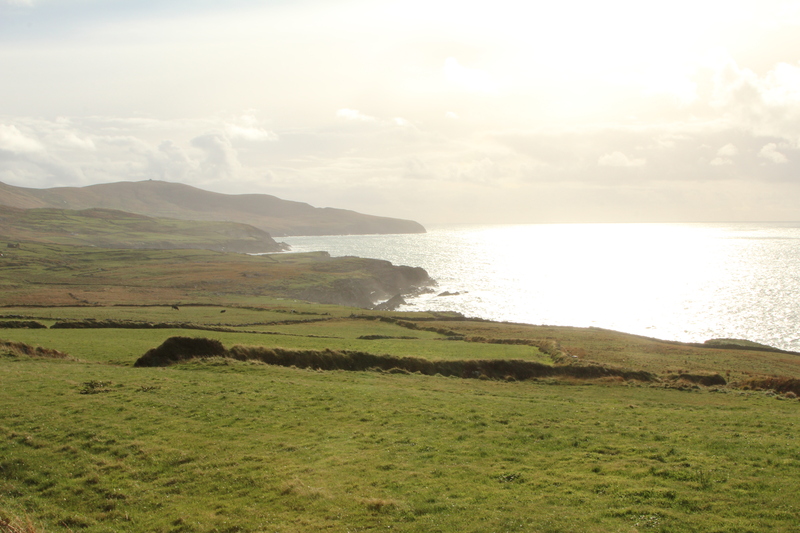 Did I mention that this is my favorite place in Ireland?). 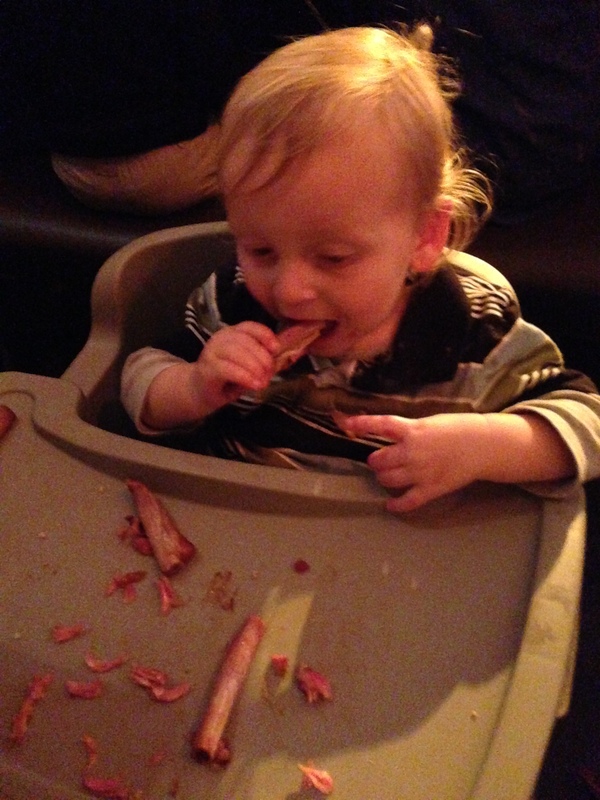 David and Jacob both consumed ribs like they were rabid little baby beasts. It was awesome. 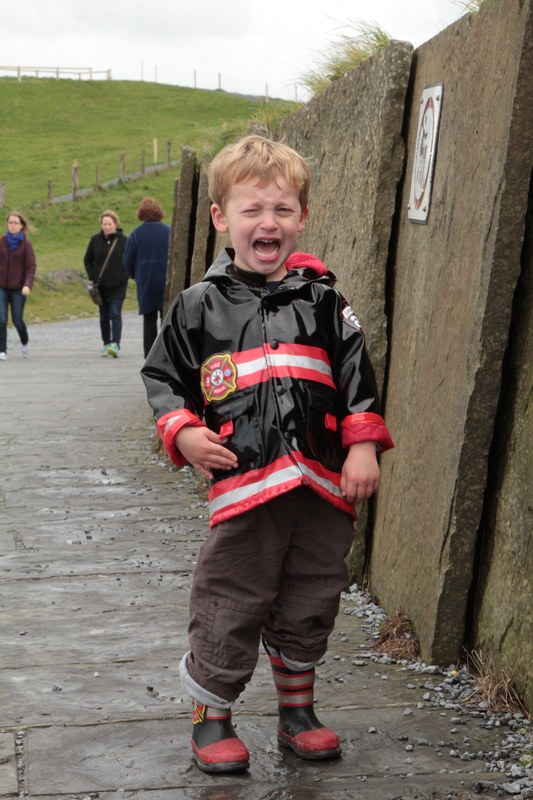 And then Jacob had a meltdown. It had been a very long day for a 1-year old, and I felt his pain. Literally. 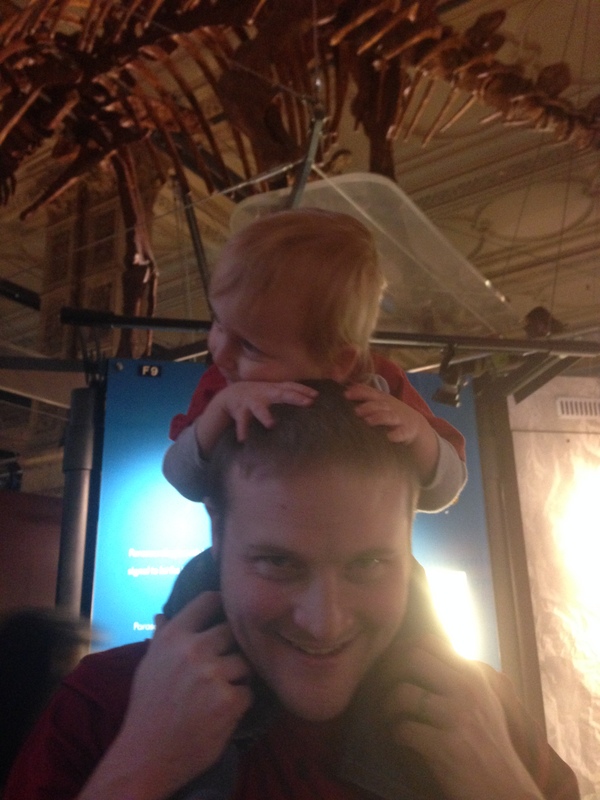 I ended up eating my dinner standing up while holding a screaming, flailing, eye-gouging, hair-pulling baby. All I can say is, thank goodness for the loud music. And the bottomless wine. That helped, too. In the end, though, it really was an amazing experience. 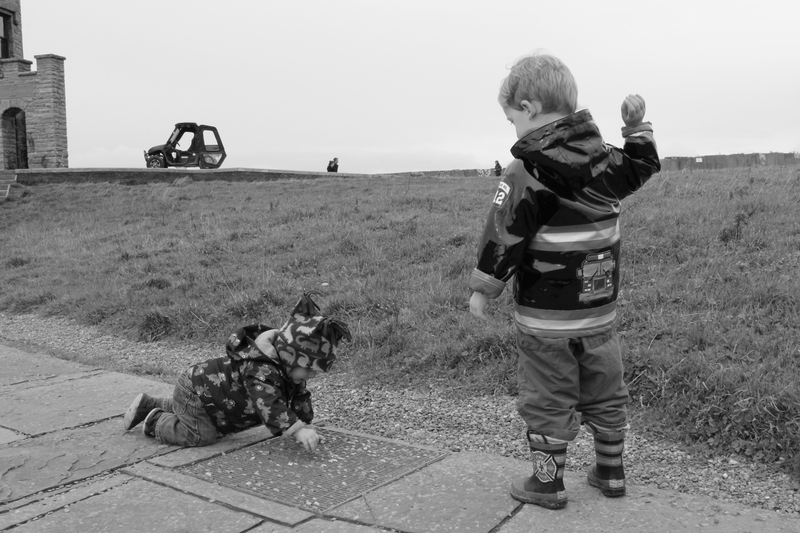 Perhaps we will return again some day with baby-restraint devices in tow. 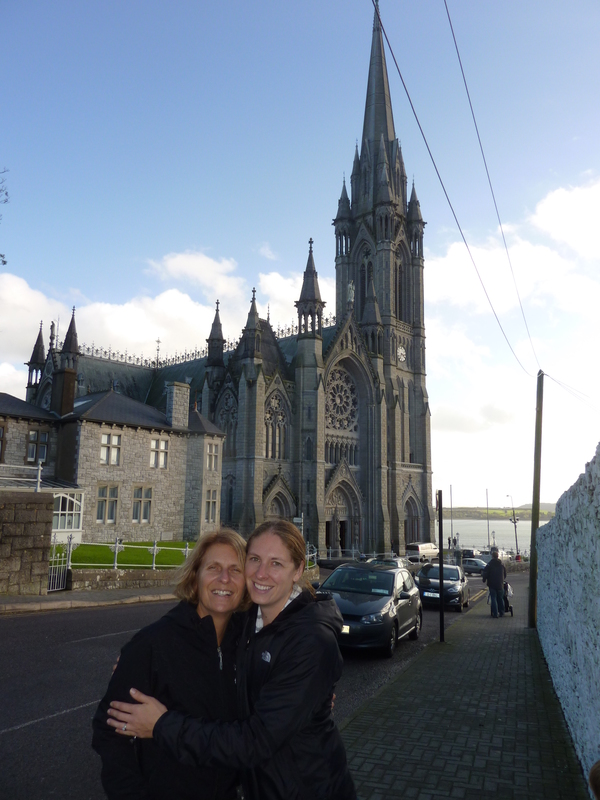 Our next outing was to the quaint town of Cobh, about 20 minutes from our house. Formerly called Queenstown, Cobh was the last port of call for Titanic before her fatal voyage out to sea. Curiously, it is also the location where survivors and the bodies of those who perished in the sinking of Lusitania were brought ashore. 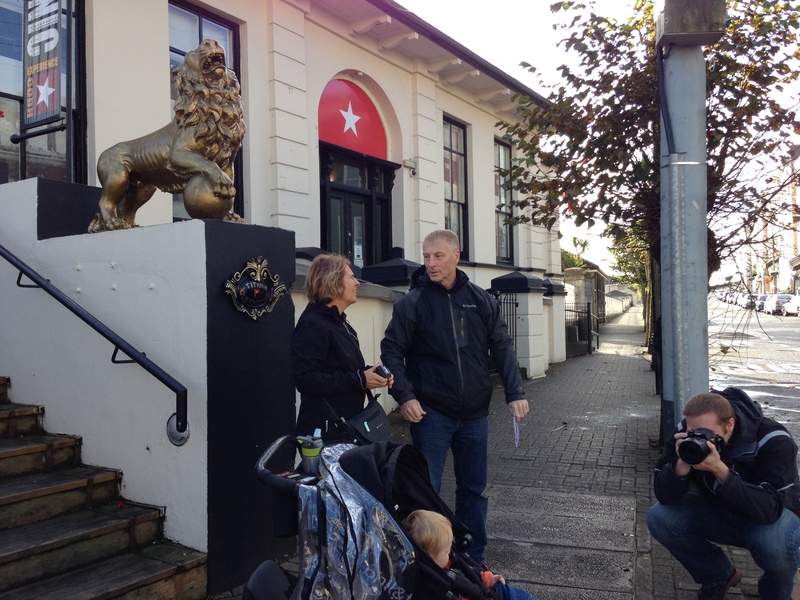 We started our day at the Experience Titanic museum, housed in the former White Star ticketing office from where passengers departed for Titanic. The museum is an interactive experience where each guest is given a “ticket” with the name of an actual passenger who boarded Titanic from this very spot over 100 years ago. As you go through the museum, you see mock-ups of the state rooms, the loading dock where passengers said their final good-byes, and audio-visual presentations. At the end of the tour you can search for your passenger to see what their fate was on Titanic (sadly, all of our passengers perished). It was a fascinating museum to visit. 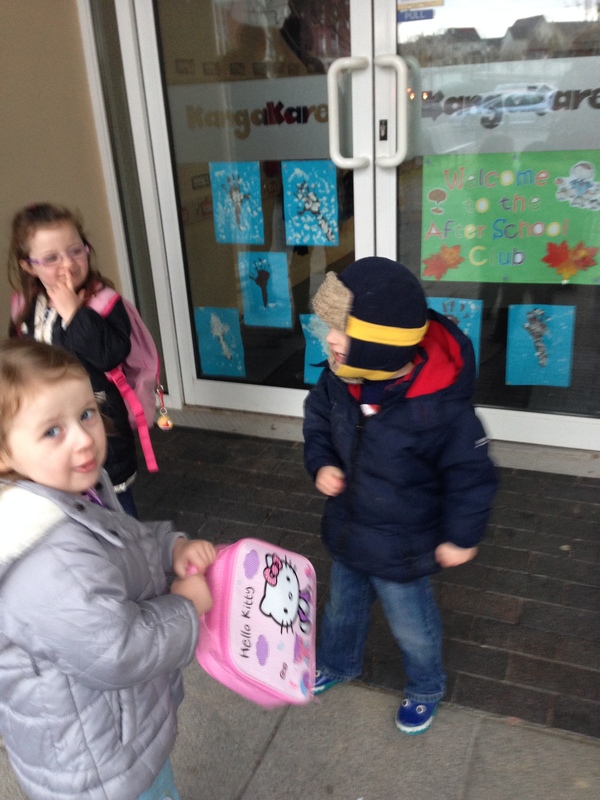 After our time at the museum we went outside to explore a bit more of Cobh. 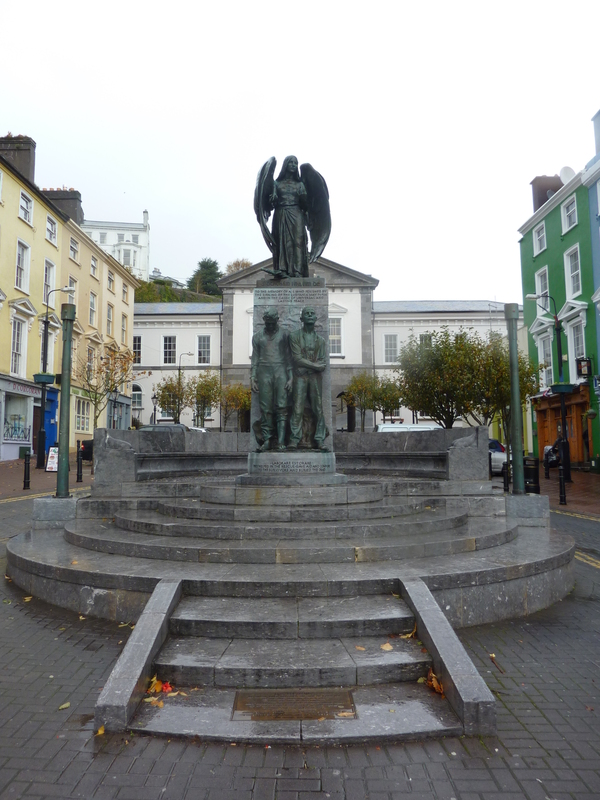 In the center of the town there is a Lusitania memorial. My dad actually has a relative who died in this shipwreck, so it was pretty humbling to stand in this place. After sufficient exploring was had by all, we headed back home. 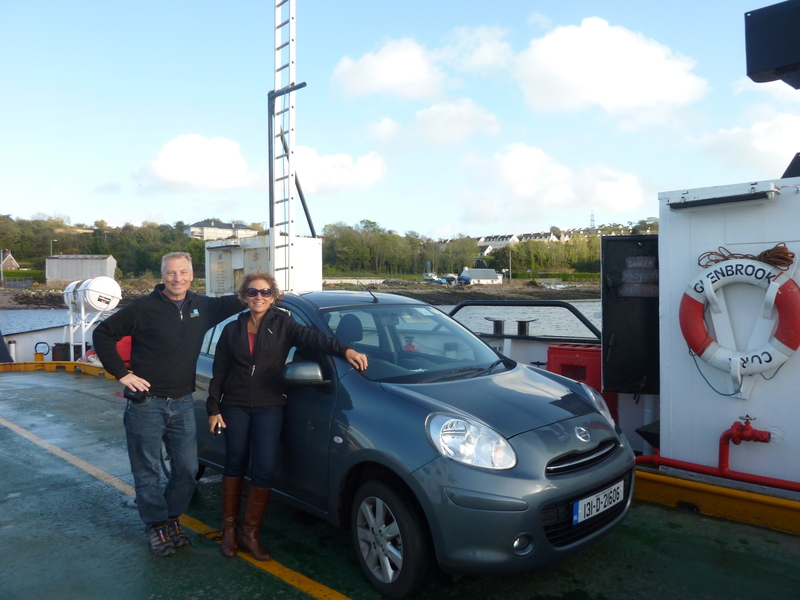 To save us a little driving time we took the tiny car ferry that runs between Cobh and Passage West right up the street from our house. 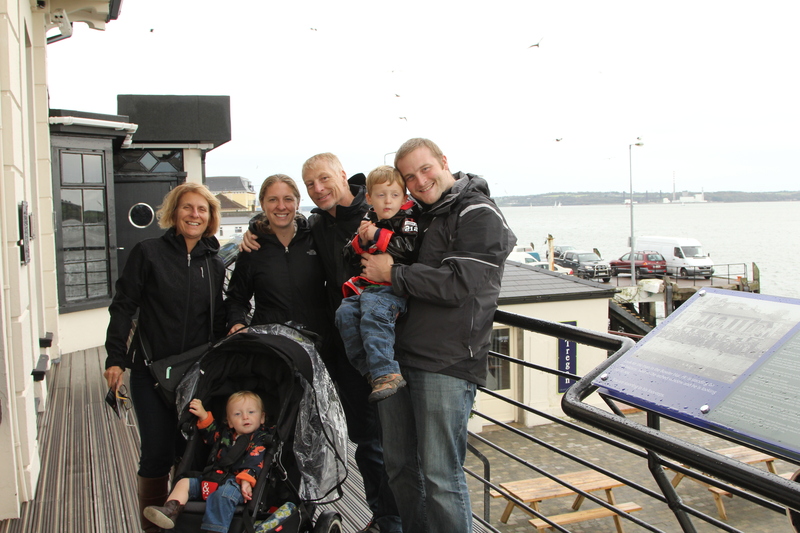 We actually had a few days between our visit to Cobh and our visit to Kinsale. We celebrated David’s 3rd birthday (detailed here), we enjoyed a fun Halloween (yes, they dress up and trick-or-treat here! 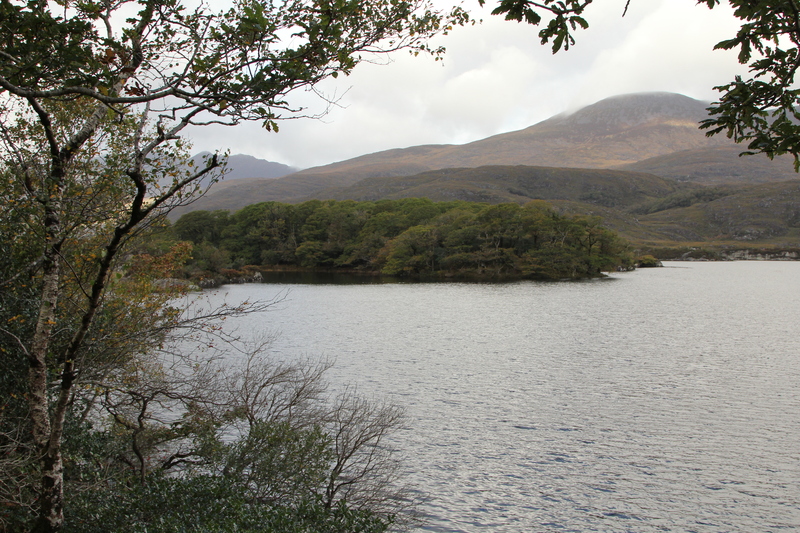 ), and Jon and I went on an over-night trip to Killarney and the Ring of Kerry (read all about it here). 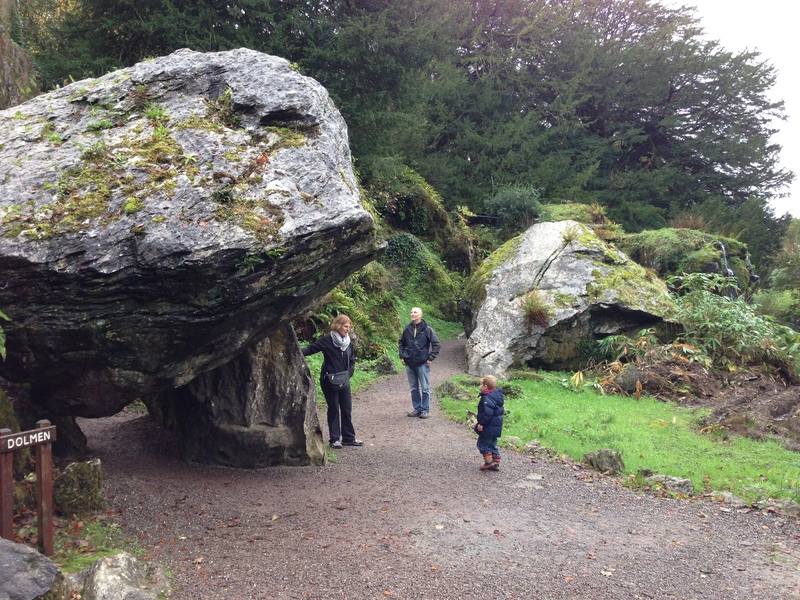 While Jon and I were in Kerry, Mom and Dad took the boys to Fota Wildlife Park and the Rock of Cashel. I think they’re pretty brave adventuring alone with our boys! 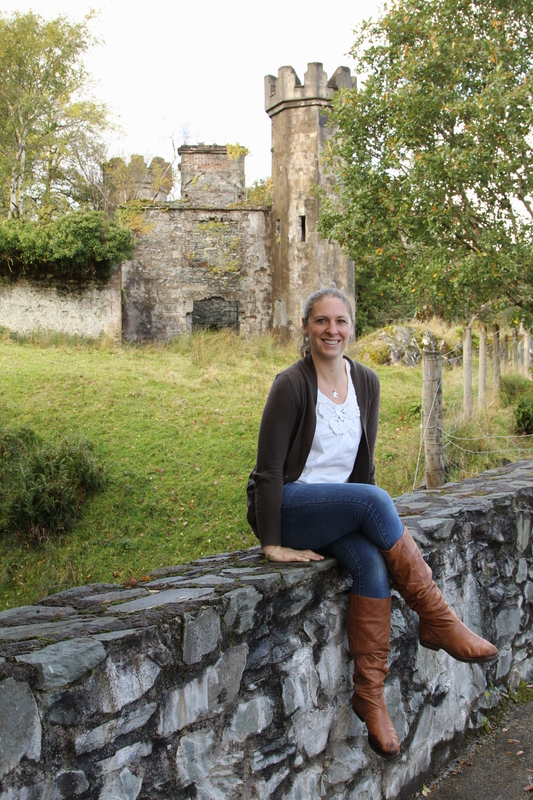 After our refreshing trip to Kerry, I was ready to continue my role as local tour guide. 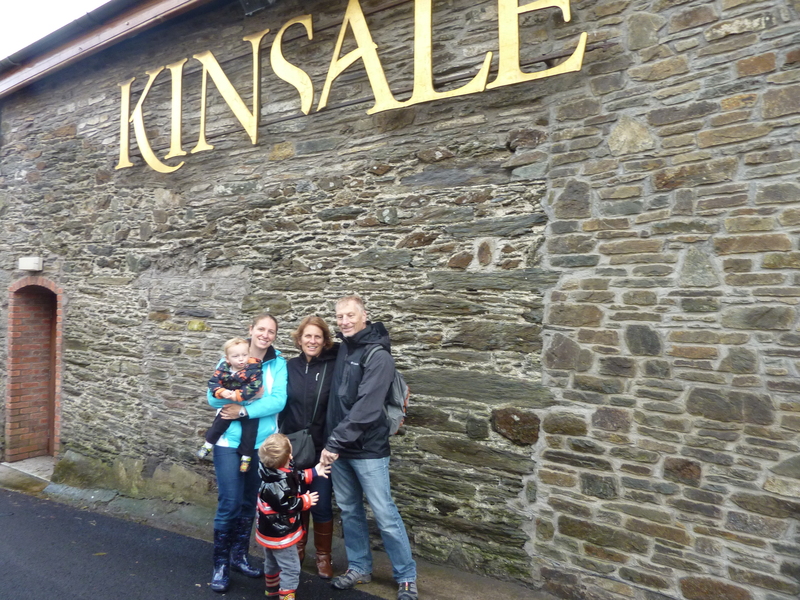 Next stop on the tour: Kinsale. 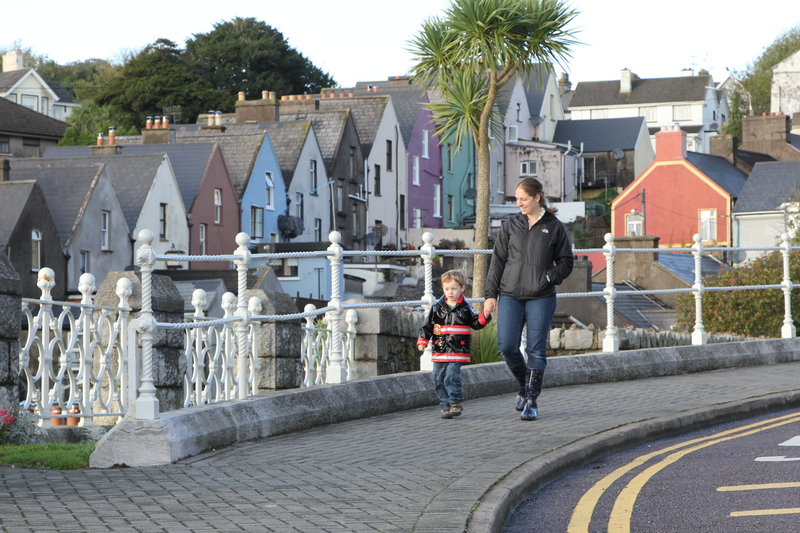 Like Cobh, Kinsale is a cute little harbor town with a character all it’s own. 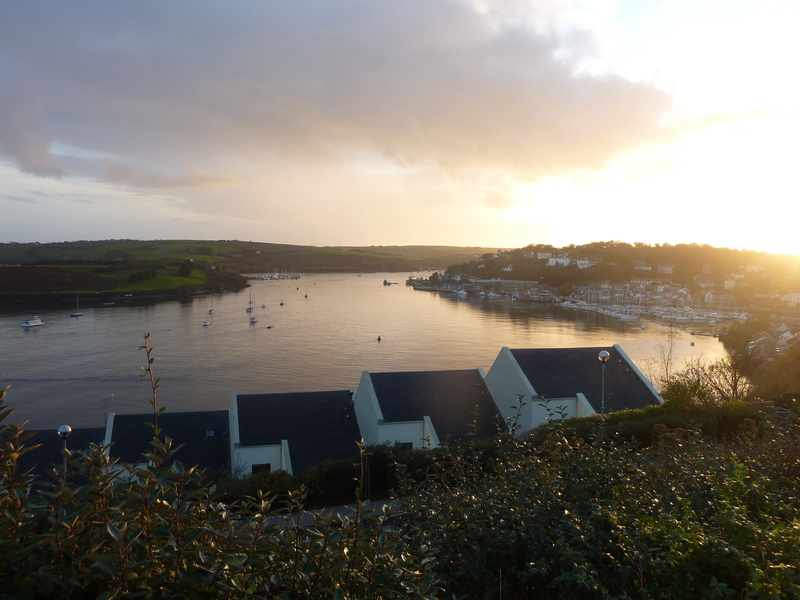 Kinsale is known as a “foodie” capital and has some of the best restaurants around. We ate lunch at my favorite cafe in town, the Lemon Leaf. After lunch we walked around town and saw some of the beautiful sights: the harbor with its pristine white sailboats, Desmond castle, shops (where I bought my first pieces of Irish art–I’m in love! ), and beautiful old churches. This is St. Multose church, built in the year 1190 and used as a place of Christian worship continually since then. In fact, they were even having a church service there while we were walking around. At about 3:00 I excused myself to take the boys home for naptime while Mom and Dad continued exploring. 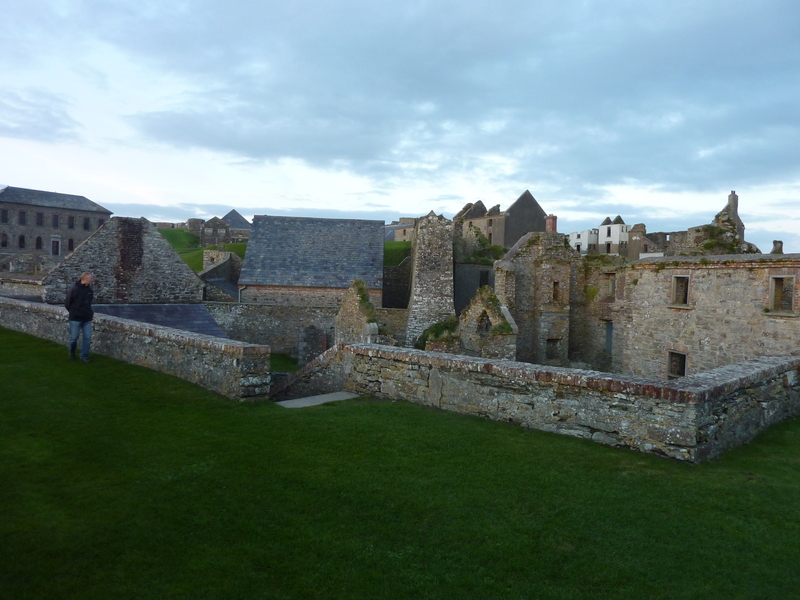 They had a pint at The Spaniard pub and then checked out the impressive Charles Fort. 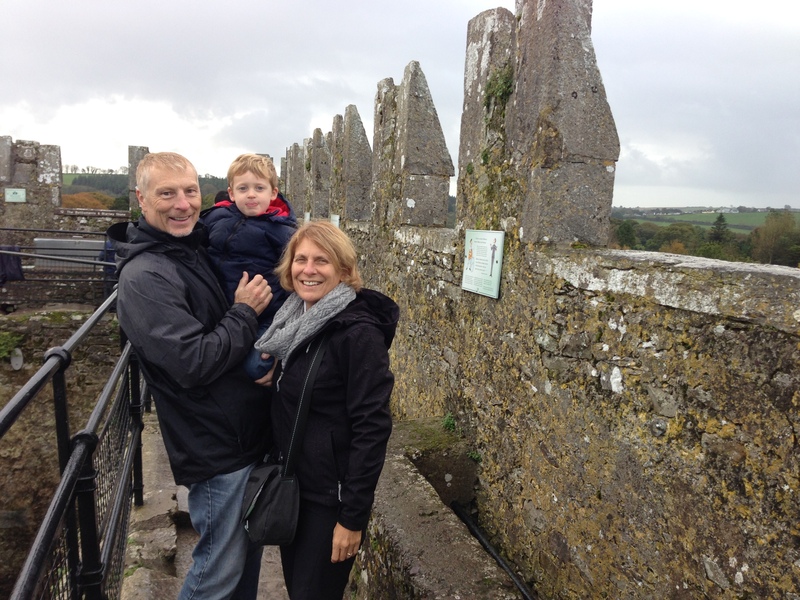 I wanted Mom and Dad to go out with a bang, so for their final full day with us it was a trip out to Blarney Castle and the famous Blarney Stone. The stone (which is said to impart the gift of eloquence on all who kiss it) is actually built into a precipice at the top of the castle. We hiked up flight after flight of stairs until we reached the roof of the castle. 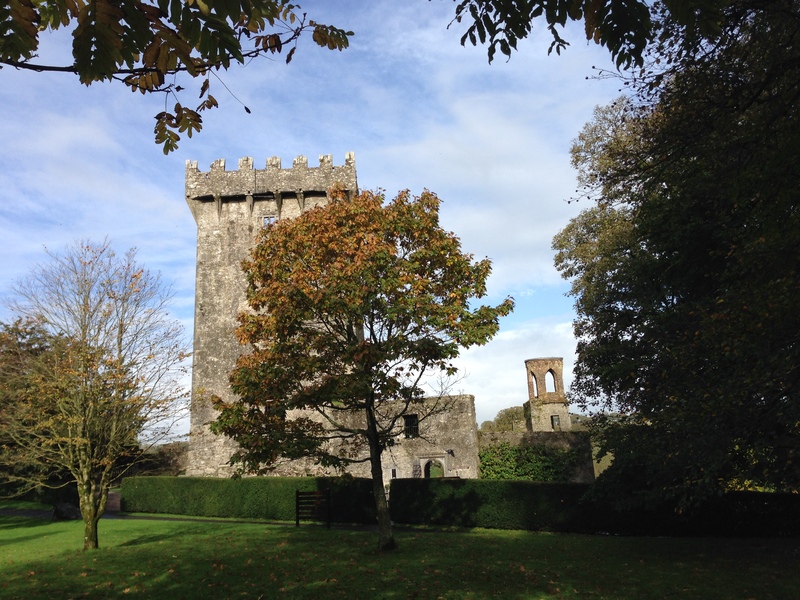 After exploring the rooms and staircases and crazy defense mechanisms built into the castle, we spent a couple of hours exploring the beautiful grounds. There are actually lakes and rivers and forests you can hike to within the castle grounds so it was the perfect place for David to get out and run around. Seeing such an amazing castle was the perfect ending to an amazing trip! It really was the visit of a lifetime. So many fun times were had and so many lasting memories were made. I think I did a good job showing them the local sites–and left just enough out that they may have to come back and visit us again. Miss you already, Mom and Dad!